I got a lot of feedback from my post last week in which I postulated an approximate SPX downside target of 1750 (see A very tired bull). While most of it was negative (more on that later), it did raise the question of where that figure came from. To recap what I have been saying for the past few months (for a summary see Why I am bearish (and what would change my mind)), the technical picture of the US equity market indicates that it appears to forming an intermediate term top, Stock market history tells us that 10% corrections happen on a regular basis, sometimes for no macro or fundamental reason at all (see The Ebola correction? OH PUH-LEEZ). 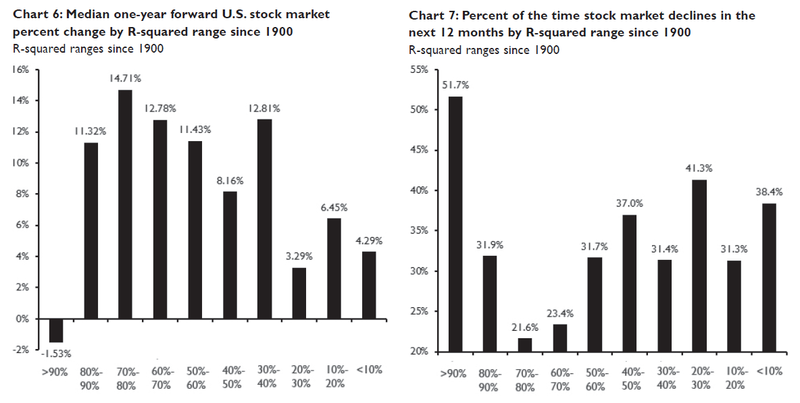 but the elements of a major bear market do not appear to be in place. 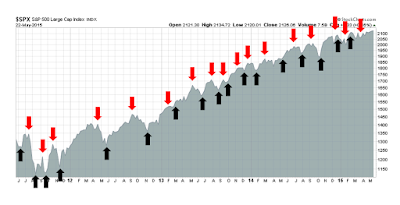 On the other hand, we have seen no SPX 10% pullback since 2011. 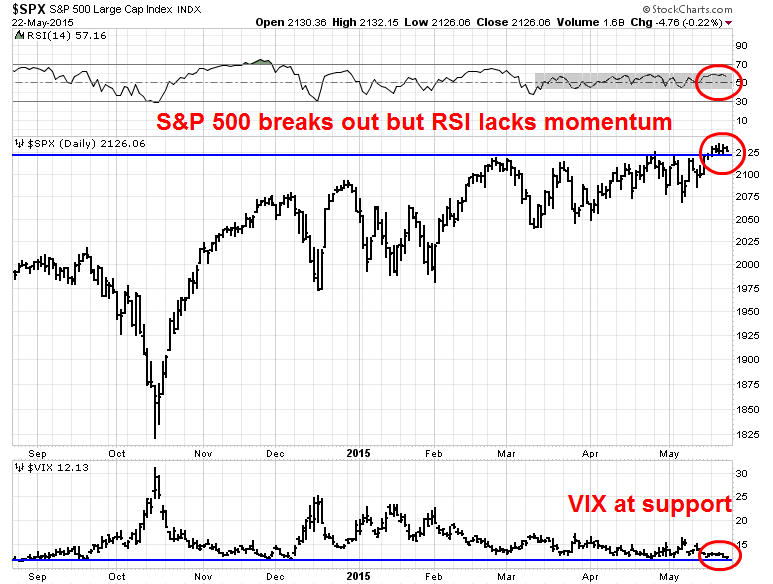 With technical conditions deteriorating, the market is ripe for a decline. While a 10% correction might be par for the course, but the intermediate term technical picture was suggestive of something more, either a substantial pullback (10-20%) or a major bear market. 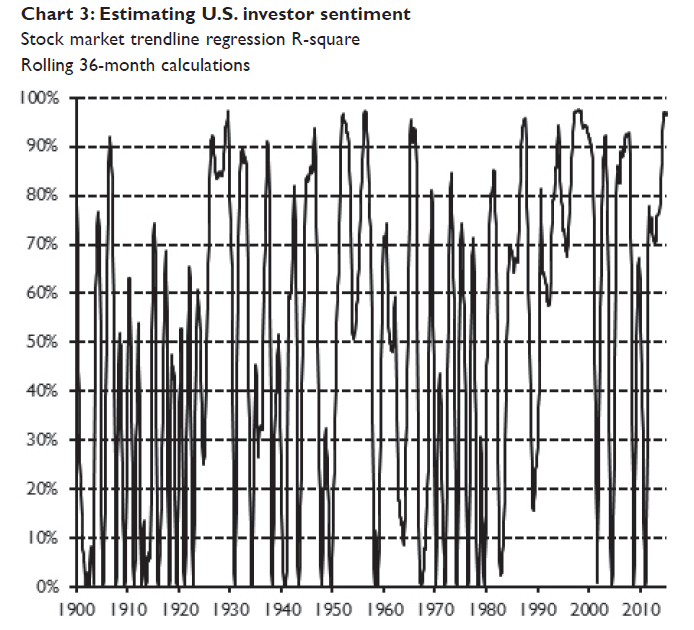 Major bear markets tend to be characterized by excessive valuations and recessions. While the American economy appears to be going through a soft patch, the risk of a full-blown recession remains low. That leaves the 10-20% pullback as the most likely and default outcome and my 1750 SPX target, or an 18% decline, is in that ballpark. However. 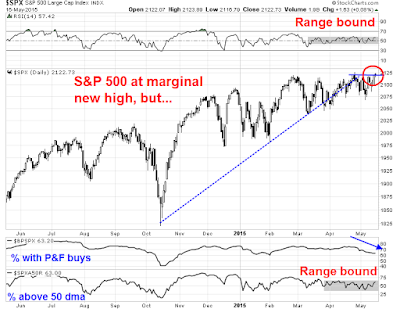 deeper 10-20% declines generally require a macro or fundamentally driven trigger. We just don`t know what that trigger is, but I will explore some possibilities later in this post. I don`t want to repeat myself so I will summarize the weak technical conditions that I have been seeing for the last few months. US stocks have gone up in a straight line with only minor pullbacks since 2011. James Paulsen of Wells Capital Management said that the steady nature of the advance has been breeding investor complacency. 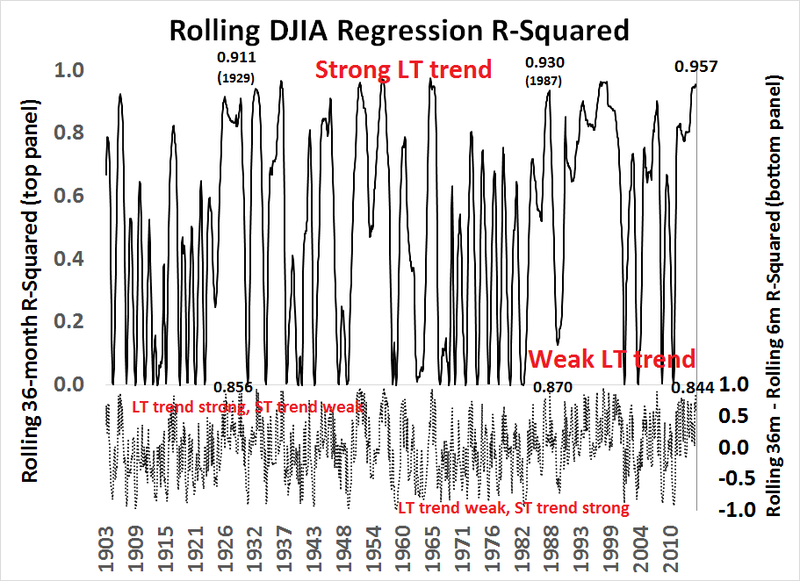 In a further study, I found that the combination of a strong long-term trend and a weakening short-term trend could be characterized as a market trend becoming "overbought" but losing momentum. 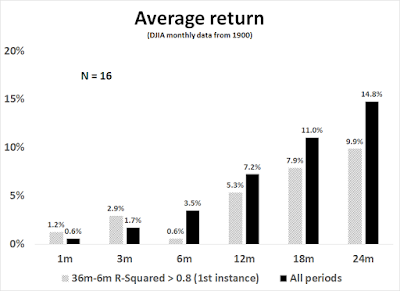 Using monthly DJIA data going back to 1900, I found that such conditions tended to resolve themselves bearishly. 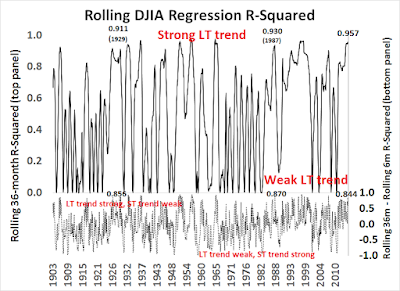 Current conditions are similar to long and short-term trend readings seen at the top before the market crashes of 1929 and 1987 (see How to make your first loss your best loss). 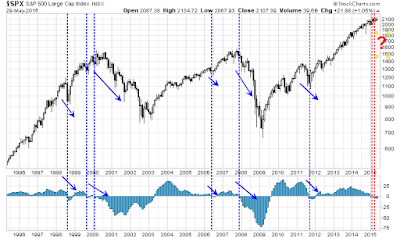 The loss of momentum that I described can be graphically depicted by the deterioration in the MACD histogram, which has declined from a positive to a negative reading (bottom panel), In the last 20 years, this indicator has had a 100% accuracy of either calling a bearish episodes or was coincidental with bearish episodes. In addition, I have detailed problems with market breadth (see What apples-to-apples market breadth is telling us), which are intermediate-term market indicators. Since I have written those words, more cracks have appeared in market internals. 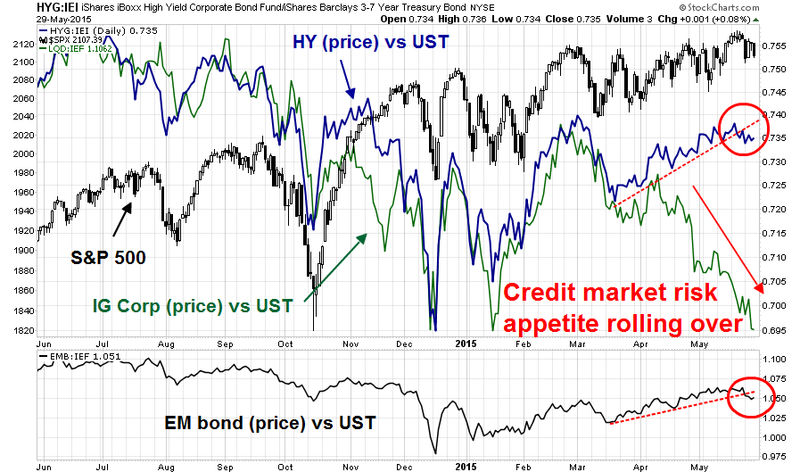 Most worrisome is the fact that credit market risk appetite seems to be rolling over. The chart below shows that the relative price performance of High Yield (blue, top panel), Investment Grade Corporate (green, top panel) and Emerging Market bonds, all of which have turned down when compared to Treasuries of equivalent duration. 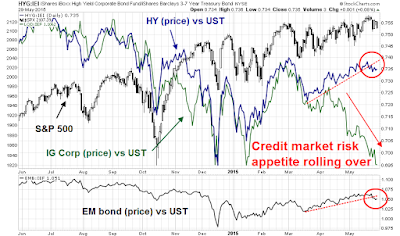 This across the board loss of risk appetite evident in the credit markets is another worrisome sign from an inter-market analytical viewpoint. As a reminder of the importance of the credit markets, recall James Carville's wish to be reincarnated as the bond market so that he could scare everybody. 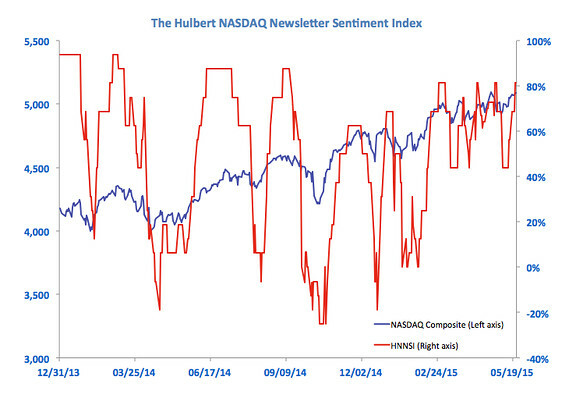 In addition, Mark Hulbert warned about the short-term vulnerability of stock prices, based on his survey of NASDAQ market timers. 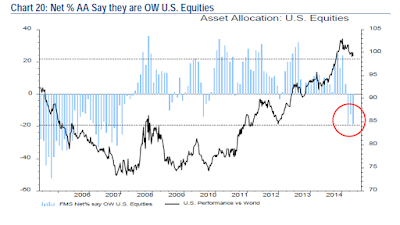 To be sure, the latest BoAML Fund Manager Survey indicates that fund managers are very underweight in US equities. 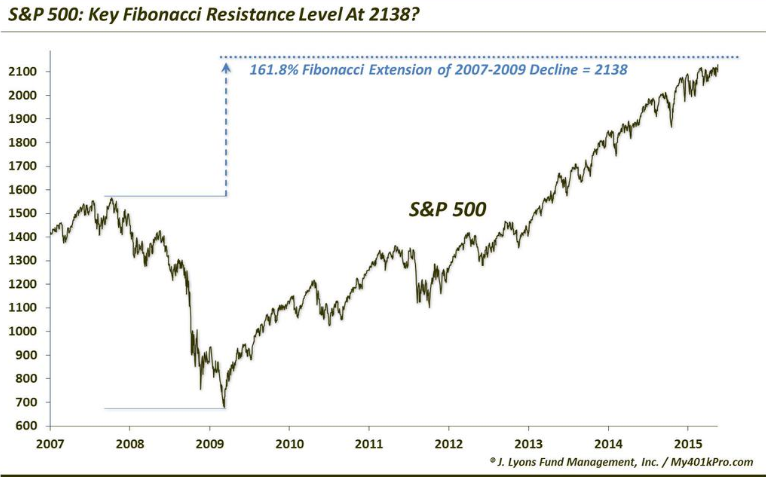 From a contrarian viewpoint, such a position could put a floor on US stock prices should they decline. At an anecdotal level, I am detecting a high degree of denial that stock prices can go down. I received a lot of negative comments from my post last week (see A very tired bull). While I am appreciative of constructive comments in the form of "I disagree with your analysis because you didn`t correct for this factor or you missed that factor...", I encountered a level of personal attacks and venom which was nothing short of astounding. Much of the tone was of the ilk, "You`re an idiot, you`re wrong and you`ve been wrong for the last few weeks". What caused all this hate? Did I declare I worship the Devil? Did I deny the Holocaust? Did I kill a baby rabbit on the radio? No. I said that stock prices would go down! The table below from A Wealth of Common Sense shows the kinds of losses that a buy-and-hold US equity investor should expect. Is it such a crime to suggest that a 10-20% loss could be expected after such a prolonged bull phase that has not seen a 10% correction since 2011? Do these people think that stocks are a one-way bet and anyone who questions that paradigm is an idiot? Not only did these comments reflect a lack of emotional maturity, but market maturity which recognizes that stock prices can go up as well as down. Despite the noise inherent in sentiment models, one of the most enduring messages I have seen is the level of uncertainty that is evident. I interpret this to be indicative of a jittery market that could stampede. 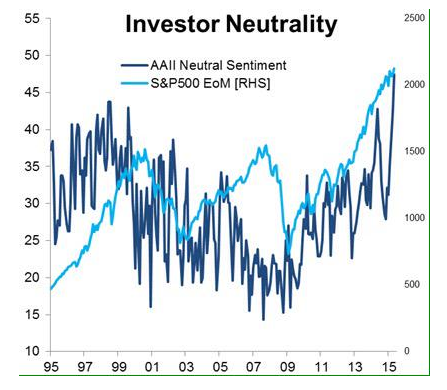 Consider the record high levels of AAII neutral opinions (via Callum Thomas). 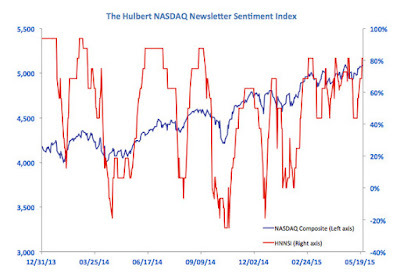 In summary, sentiment models are tilted bullishly, which is contrarian bearish. However, there is a great deal of uncertainty. If a bearish trigger were to appear, it has the potential to start a selling stampede. 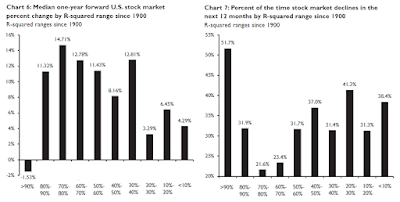 Today, the most common attitude seems to be everything is fine and you should own stocks. Should a stampede start and stock prices go down 10-20%, then you will be highly hesitant about buying them at the bottom. For that to happen, we need a macro or fundamental trigger. 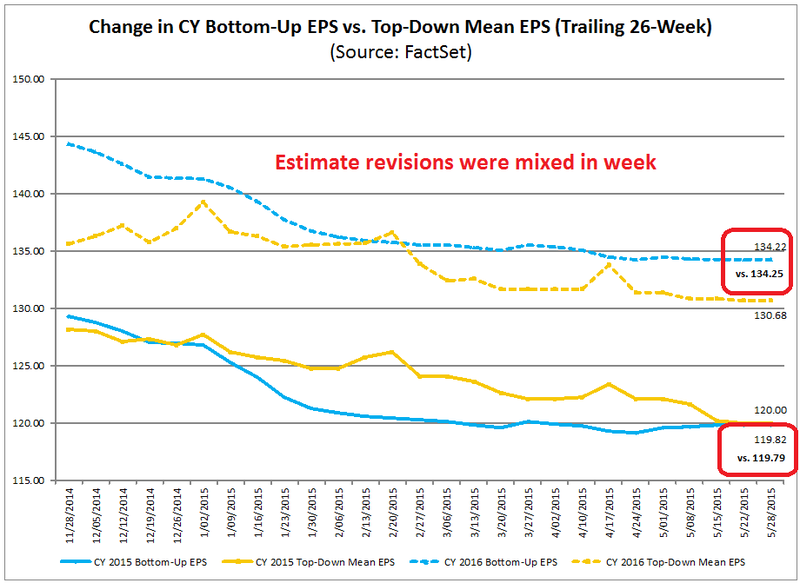 The latest update from John Butters of Factset show that consensus EPS estimates revisions to be roughly flat, with FY2015 rising and FY2016 falling. More worrisome is Factset's report that with Q1 Earnings Season more or less complete, the revenue beat rate came in at an abysmal 45%. Ed Yardeni also observed that forward revenue estimates are falling, though his estimates of forward EPS estimates are rising. Combine those wobbly conditions with a round of Fed tightening and we have weak EPS growth and rising interest rates - which are exactly the elements of a stock market downturn. With employment growth still relatively robust, it would be not be hard to imagine a series of NFP releases that show employment growth above expectations and rising wage pressures, or a mini-stagflation episode. Indeed, the latest Financial Stability Review from the European Central Bank fretted about what might happen when the Fed starts to raise rates. 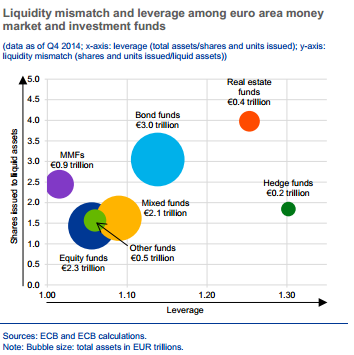 The combination of illiquid markets (remember the recent Bund market selloff), a crowded long in risky assets and financial leverage, especially in the shadow banking system, could set off a stampede for the exits. 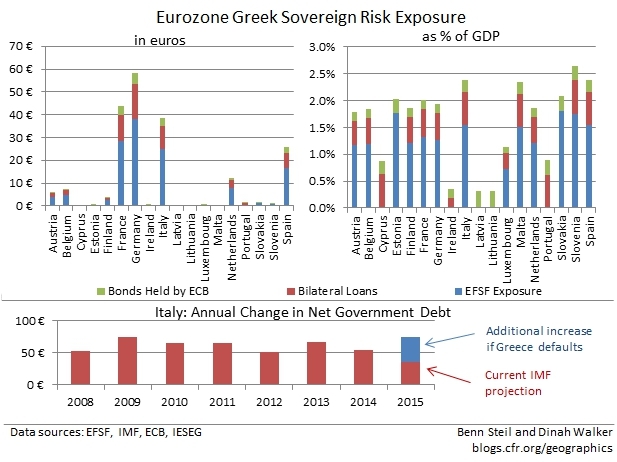 Greece: Time to cry wolf again? Raise your hand if you`re tired of the Greek drama. Like the story of the boy who cried wolf too many times, this may be the time that the wolf finally appears but the villagers are too tired to care. Here is my understanding of the situation with the Greek negotiations and the fragility of the current negotiation dynamics. Unlike previous occasions, there may not be any backroom deals to be done as the current Greek government does not seem interested in preserving the status quo. We have to understand the internal pressures each side face. The Syriza dominated government in Athens has a very narrow majority and risks an internal rupture with its own Leftist elements should it budge from its own red lines of pension and wage cutbacks. This Project Syndicate essay by Greek finance minister Yanis Varoufakis argues eloquently that forcing austerity budgets on Greece in order for its government to run high levels of fiscal account surpluses is counter-productive to its growth outlook and therefore debt repayment sustainability. From the EU viewpoint, those pleas are falling on deaf ears. The EU cannot be seen to bend against its own stated austerity doctrines, as it would threaten to topple governments in other peripheral countries. Already, anti-austerity elements are gaining power in Spain and Portugal. As well, there are local elections in Italy this weekend, which will be a key test of the Grillo anti-Europe 5-Star Movement. With much of Greece firewalled from the worst of the tail-risk of financial contagion, a Cyprus-style Greek default within the euro may be preferable outcome instead. The most worrying case among the creditors, though, is heavily indebted Italy, which would bear up to €39 billion in losses, or 2.4% of GDP. Italy’s debt dynamics are ugly as is—the FT’s Wolfgang Münchau called them “unsustainable” last September, and not much has improved since then. The IMF expects only 0.5% growth in Italy this year. As shown in the bottom figure above, Italy’s IMF-projected new net debt for this year would more than double, from €35 billion to €74 billion, on a full Greek default—its highest annual net-debt increase since 2009. With a Greek exit from the Eurozone, Italy will have the currency union’s second highest net debt to GDP ratio, at 114%—just behind Portugal’s 119%. With the Bank of Italy buying up Italian debt under the ECB’s new quantitative easing program, the markets may decide to accept this with equanimity. 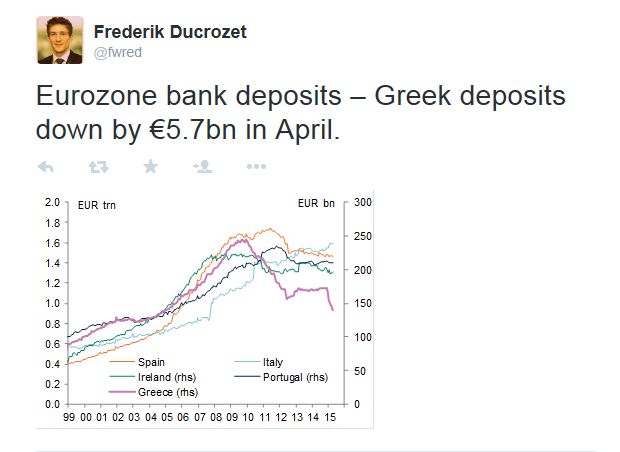 Yet assuming that a Greek default is accompanied by Grexit, this can’t be taken for granted. Risk-shifting only works as long as the shiftees have the ability and willingness to bear it, and a Greek default will, around the Eurozone, undermine both. Should Athens default, it would put enormous strain on the Italian budget as it and other eurozone countries were counting on those funds to maintain some semblance of fiscal balance. While a Greek default would not have the kinds of catastrophic consequences it might have had in 2010 or 2011, the outcome would still be negative. Peripheral yield spreads would start to blow out and we could see a risk-off stampede in an illiquid market (see the concerns expressed above in the ECB Financial Stability Review). 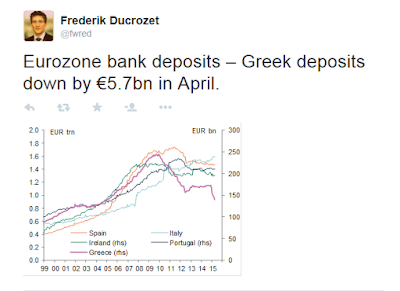 In the meantime, the Greek banking system continues to bleed euros. The ECB can put the squeeze on Athens at any time should negotiations falter and the Greek banking system would implode. A payment of about €300 million is due to the IMF on June 5. The latest news reports indicate that Athens will make that payment, but no deal is in sight. If Athens were to overcome the June 5 IMF payment hurdle, there is another €348 million due the IMF on June 12, followed by €581 million on June 16 (see calendar from Bloomberg). As well, there are substantial pension and civil service salary obligations due during the same period. In the meantime, we may have to endure this cycle of stories out of the Greeks that a deal is imminent, but denials out of the EU-IMF camp that much more work needs to be done, much like how Zeus punished Prometheus for giving fire to humans by chaining him to a rock and having an eagle rip out his liver on a daily basis. How much of more this liver-ripping can the markets take? 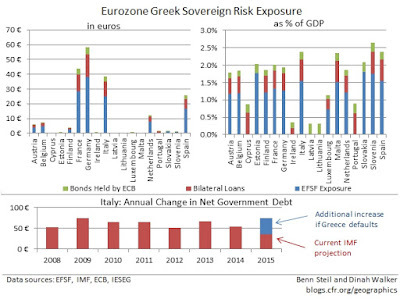 If an agreement cannot be reached, a Greek default could certainly be the catalyst for a significant risk-off market decline, especially if the contagion effects spread to other countries like Italy. 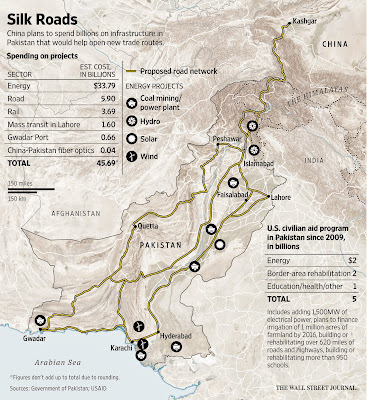 China: In search of a casus belli? 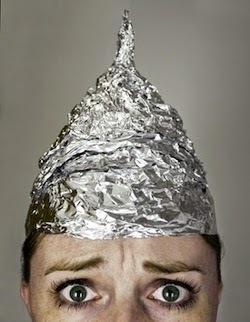 I hate to mention China as this puts me in the camp of the tinfoil hat brigade. While I am concerned about the volatility in the Shanghai stock market and the risks of a disorderly sell-off. There is about USD 1 trillion of Chinese debt sloshing around in the offshore USD market and no one really knows how inter-connected the global financial system is and what the effects of one or more major Chinese corporate defaults might be. That's not where the major tail-risk from China is coming from. I am more concerned about the possible effects of a military confrontation in the South China Sea. Despite the speculative element of this story, which probably belongs more over at Zero Hedge, one of the ways investors make money is to watch for stories on page 14 that migrate to page 1. While this story may stay on page 14 and die, it has the possibility of moving up to page 1. In the past few weeks, I have been seeing more and more stories about how China has built seven artificial islands in Spratly Islands, located in the South China Sea. These moves were presumably intended to bolster Chinese claims to the area. While friction occurs in international relations all the time and could be resolved by quiet diplomacy, the US and her allies appeared to have deliberately chosen a course of action designed to provoke and confront China. The WSJ reported that Chinese artillery had been spotted on the new islands. Though the artillery poses no threat to the US, they have now disappeared. Why trumpet a story about artillery that may or may not be there? Why invite the press to a Navy patrol plane flying over the area, where they were certain to be challenged by the Chinese? Why did Japan's Nikkei Asian Review feature a story about President Xi being leery of a coup and assassination? Was it a deliberate attempt to portray the Chinese leadership as being weak? If so, who planted the story? China recently unveiled its white paper on military strategy. It was then spun in a hostile and provocative manner: If U.S. Interferes In China’s Land Grab, "War Is Inevitable"--The Global Times. There are alternate routes to Japan, Korea, and the Philippines via the Lombok and Sunda Straits in the Indonesian archipelago, and up through the Celebes and Sulu Sea. Don’t take my word for it. Ask Japan, which has obsessively investigated “energy security” since the OPEC oil shock of the 1970s and has gamed the economics of non-Malacca/non-SCS routes to a fare-thee-well. Bottom line: to avoid Malacca/SCS completely by switching to the Lombok route, shipping costs to Japan go up maybe 13.5% over the Malacca route. In other words, less than half a penny a barrel (see page 65). Back of the envelope, increase in Japan’s oil import bill of maybe $150 million. Maybe $200 million? For comparison, value of Japan’s crude oil imports from GCC in 2014: $100 billion. 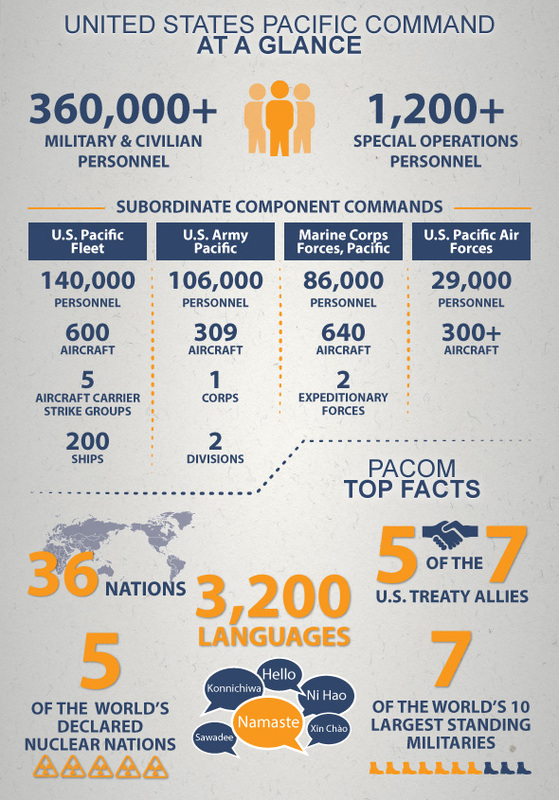 Japan’s 2014 defense budget: $42 billion. Incremental cost of securing Japan’s energy imports from the PRC threat in the South China Sea: A rounding error. Pretty much same order of magnitude for South Korea. Added costs for Philippines to access its ports at Manila, Subic Bay, the Batangas terminal: Basically zip. The Lombok route run right through the Philippine archipelago. As for Vietnam, it’s a net oil exporter. In any case, its vital ports lie outside the dreaded “cow tongue” and are accessible without traversing the South China Sea. If the US, along with her allies, is staging a deliberate campaign of provoking China, then we may building up to some sort of military confrontation in the summer. In that case, watch regional trade crater and the "Greater China" stock markets, which have been holding up relatively well, go into freefall. I don`t want to sound some paranoid maniac writing for Zero Hedge, but Spratly related tail-risk is rising. If the shooting starts, then we would definitely be in a situation where the price of risky assets crater. 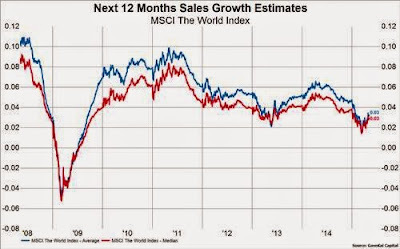 World trade would collapse and you will hesitate about buying stocks, even though they have gone down 10-20%. I would discount scenario 1 as the kinds of intermediate term indicators tend to be predictive of higher magnitude market weakness. I would rule out scenario 3 as there doesn`t seem to be a recession on the horizon, which is the catalyst for a major bear market. That leaves scenario 2, a 10-20% pullback, by default. My most likely scenario is therefore a 10-20% decline, much like the experience of 2010 and 2011, both of which saw the market fall 15-20%. 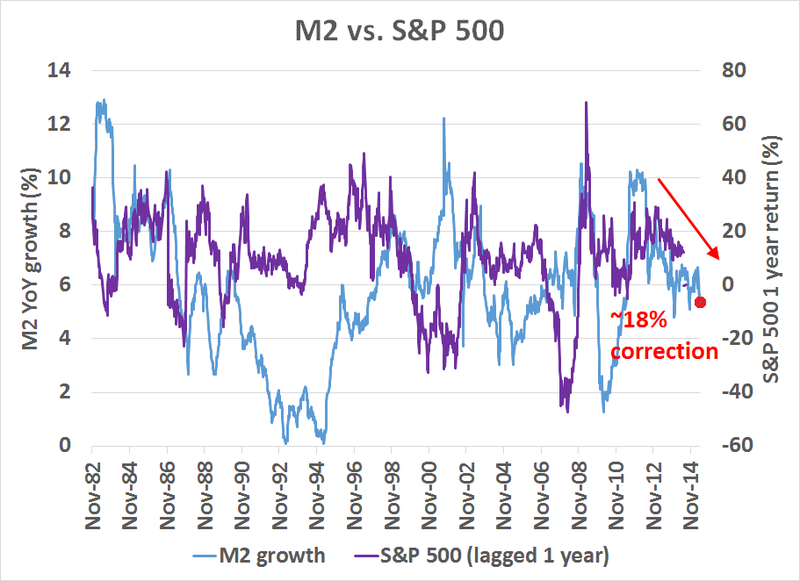 My M2 analysis last week indicated a rough downside potential of about 18%, which sounds about right under the circumstances. As for the week ahead, a minor decline appears to have begun, just as Springheel Jack predicted. Despite all of the bearish intermediate term indicators, which are not good at forecasting daily squiggles in stock prices, I am not fully convinced that we have seen the start of a major decline yet. 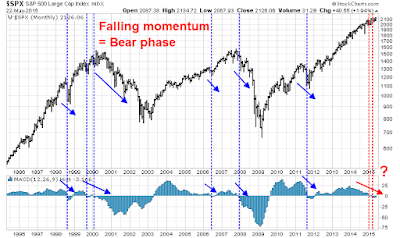 If the market were to behave has it has in 2015, short-term momentum indicators suggest that it is nearing a point it is likely to bounce. 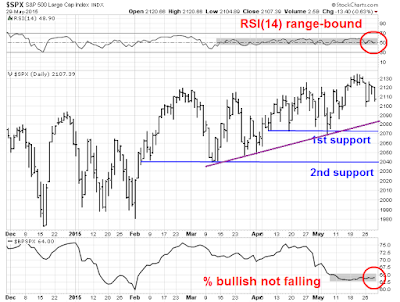 Here are my bearish tripwires for a major downleg in US equities. First, we need to see some conviction and follow-through in market moves. 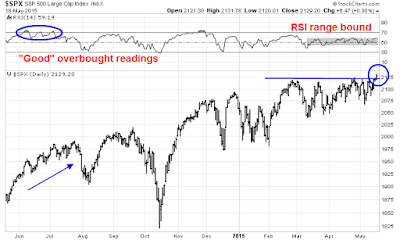 As the chart below shows, RSI(14) momentum remains range-bound and hasn`t shown either an overbought or oversold reading in weeks. A major fall in stock prices would involve a series of "bad" oversold readings where the markets get oversold and stays oversold. In addition, the % of SPX stocks showing bullish formations on point and figure charts should be cratering, which it hasn`t so far. At the very least, I would watch for the violation of the uptrend line at about 2085 (in purple). The next test is a violation of the first support level, which is roughly 2070, and a test and violation of the second major support at about 2040 before declaring that a major correction has begun. A cold day in summer means we have to wear a sweater and long pants, not shovel snow like we would in winter. In contrast, a warm day in winter doesn’t mean we go for a swim and get a sunburn. Seasons change the parameters for the weather. By now, we all know the story of China's troubles. China achieved its stunning growth through a combination of the adroit utilization of cheap surplus labor and financial repression, which financed much of the infrastructure required for its initial growth phase. In the wake of the Great Recession, Beijing unleashed a shock-and-awe monetary and fiscal stimulus campaign of credit fueled infrastructure spending. And boy, did the economy respond. Seven years later, it's time to pay the piper. The country is littered with see-through property developments and white elephant infrastructure projects like airports, port facilities, railways and so on. At the same time, China seems to be hitting its Lewis turning point, when running out of cheap labor is hampering its export competitiveness. The Party's response was outlined in the Third Plenum, where it aimed to re-balance growth from credit fueled export and infrastructure growth to consumer driven growth. At the same time, it would gradually open up its capital account and do away with financial repression, which financed the growth surge of the last twenty years on the back of the household sector. But re-balancing growth means slower growth - and slower growth will increase social pressures. If uncontrolled, social pressures have the potential to undermine the Party's legitimacy. Taken to its logical conclusion, it would mean the end of Communist Party rule in China. Almost every week, we see news of faltering growth in China. Moreover, slowing growth undermines the stability of the financial system, because much of the infrastructure growth was built by debt. Measures such as interest rate cuts and RRR cuts are only band aid solutions, designed to prevent the roof from caving in. Even the stock market bubble is only a temporary device to alleviate financial pressure. It has been suggested that elevated stock prices allow SOEs to do a debt for equity swap at sky high valuations, which would alleviated some of the debt pressures facing those companies. In addition, the PBoC has unveiled a LTRO-like program where banks could exchange limited amounts of local government debt for central government debt (see the problems with that plan as outlined by FT Alphaville). In effect, it would transfer local government debt to Beiing`s balance sheet. All these initiatives are stop-gap measures, but do not constitute a legitimate growth adjustment strategy. If this was television, one of the underlings would whisper in the leader`s ear, "Sir, I have a cunning plan!" Obviously, an impoverished country like ours can’t afford to look a gift horse in the mouth, especially if the horse in question is Chinese, and happens to be the only ride in town. ‘Game-changer’ is the expression most commonly being bandied about to describe the windfall. If we were to believe the TV anchors and their chat show guests, it’s as though we had hit the jackpot, and could all retire to Dubai. For a dose of reality, just look what has happened in (and to) Sri Lanka with its spate of Chinese deals. The new government of Presi­dent Sirisena is struggling to cope with the Chinese-financed and built projects it has inherited from the Rajapaksa administration. The most contentious of these is the Colombo Port City with an investment of $1.35bn coming from the China Communi­cations Construction Company, a huge government-controlled entity. This ambitious project — halted since the new government came to power earlier this year — is spread over 575 acres, part of which is to be reclaimed from the sea off Colombo’s shore. Aimed at developing residential, entertainment and business spaces and facilities, the venture was designed to make Colombo a popular destination for tourists as well as a vehicle for investment in real estate. The problem is that the sponsors took many short cuts, ignoring important environmental requirements. Now if Sri Lanka cancels the deal, it stands to lose millions of dollars in penalties. Several other public-sector projects funded and built by the Chinese are now lying virtually abandoned. Hambontota Port in the south is a case study in how to invest in useless infrastructure projects. When the new port was declared open about four years ago, a huge boulder was discovered in the channel that made navigation impossible. This obstruction was dynamited over months, but even now, it took a government directive to force car-carrying ships to dock there. Cars then have to be transported 250km to Colombo by road. Other Chinese-financed projects in the area include an international airport and a cricket stadium. Both are unused. A huge conference centre, financed by South Korea, is virtually derelict. The major users of the motorway around Hambantota are water buffaloes. One reason for all this ill-considered construction activity is that it happens to be in the ex-president’s constituency. But to his credit, Rajapaksa focused on road-building, and there is now an excellent network in place. However, the huge difference in construction cost has raised many questions about transparency, especially about roads built with Chinese funding and by Chinese contractors. For instance, the Southern Expressway connecting Colombo to Galle, financed by the Asian Development Bank and Japan, cost $7 million per kilometre. By contrast, the Outer Circular Highway connecting the airport to the Galle Expressway, financed by a Chinese loan and awarded without competition to a Chinese firm, is going to cost $72m per kilometre. For some context into the USD72 million per kilometre price for the highway, studies by the World Bank and Oxford University showed that typical developing country road development cost between USD 0.9 to 7.8 million per kilometer. A cost of USD 72 million is roughly equivalent to Japanese highway construction, which reflects the astronomical costs of land acquisition. No doubt many well-connected Chinese construction companies will get very rich off the OBOR initiative. Some of the countries participating in the OBOR scheme have large current account deficits and unfavorable economic fundamentals, making them high-risk borrowers, BoAML pointed out. This means Beijing is taking on greater default risk by providing them with capital and financing projects in those nations. In the years leading up to the AIIB, China built bilateral partnerships for infrastructure projects in emerging-market countries, such as the nine-year-old China-Africa Development Fund. More than half of the 89.3 billion yuan in overseas development funds spent by the government between 2010 and 2012 was in the form of policy bank loans. This bilateral approach, however, triggered disputes between many recipient countries and China. The friction was tied to problems with project operations, environmental protection and social issues, for example. These problems point to "one reason that China is attracted to a multilateral approach, namely by starting the new Asian Infrastructure Investment Bank," said David Dollar, a researcher at the John L. Thornton China Center at the Brookings Institution think tank in Washington. "On the other hand, (China's bilateral approach) track record makes some countries, like the U.S., nervous about how the new bank will operate." 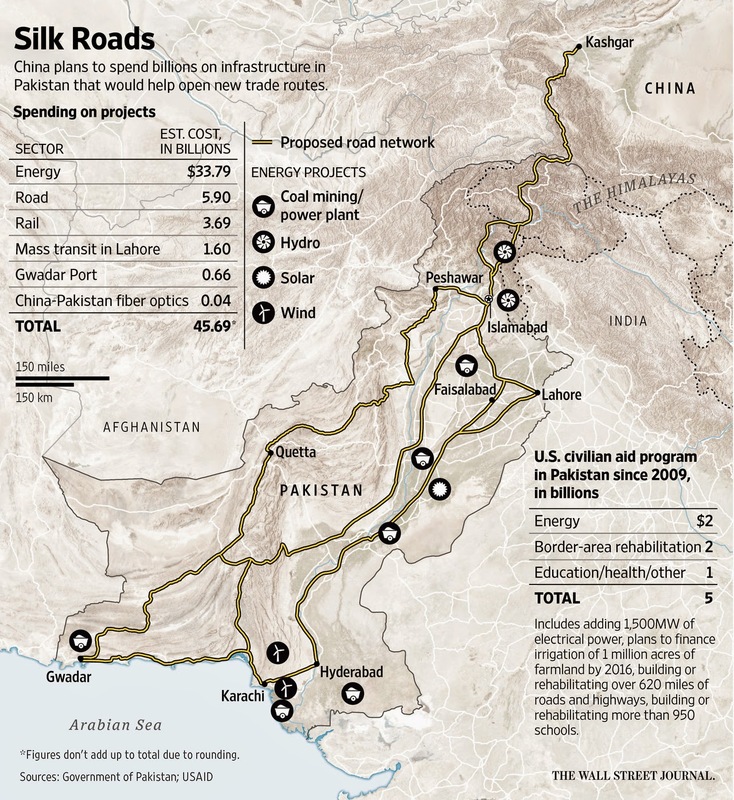 In addition,AIIB could then to finance OBOR projects. Chinese banks wouldn`t have to bear all the credit risk and overload their balance sheets. Instead, Bejing could sucker the foreign devils persuade their major trading partners to financing these projects instead. China is planning to invest up to $50bn (£32bn) in Brazil for new infrastructure projects. The deal is due to be signed by banks from both countries during a visit by Chinese Prime Minister Li Keqiang to Brazil next week. The money will go towards building a railway link from Brazil's Atlantic coast to the Pacific coast of Peru to reduce the cost of exports to China. It says the fund will also finance a joint venture to produce steel. A Chinese scheme to build an east-west railway across South America, cutting across parts of the Amazon rain forest, has moved a step closer after Peru agreed to study the proposal. If completed, the railway would stretch 5,300km (3,300 miles) but campaigners fear the impact on indigenous people. Brazil, China and Peru will now begin feasibility studies into the railway. These initiatives are examples of how Beijing plays the long game in formulating a growth strategy. Export and infrastructure strategy wobbly? No problem. We'll take steps to rebalance the economy towards household consumption. To avoid the catastrophic effects of a hard landing, use monetary, fiscal and what`s left of the command economy to cushion the worst effects of the slowdown as the economy rebalances. At the same time, export the capabilities and expertise of infrastructure building to other parts of the world. In the meantime, these benefits from foreign infrastructure growth would serve to offset the falloff in Chinese domestic infrastructure growth as the economy slowly re-balances towards household consumption. At the same time, Beijing would enhance its political influence throughout Asia. I recently wrote a post outlining the reasons why I believe that the next major move in the US equity market is down and I drew my lines in the sand for turning bullish (see Why I am bearish (and what would change my mind)). To summarize, the main reasons for my bearish outlook is the combination of an extended uptrend and flagging price momentum. These conditions can be shown in a number of ways, but the best graphical example is the deterioration in MACD histogram from positive to negative. Past episodes have always resolved themselves bearishly in the last 20 years. Since I wrote that post indicating my bearish concerns, negative technical divergences continue to pile up (see What apples-to-apples market breadth is telling us). As you can see from the charts above, we've recently made fresh highs in SPY. During that period, we've seen below average buying pressure (the zero level is average) and more than average selling pressure (values below zero show heavier selling). That suggests that more stocks have been trading on downticks than upticks, even as the broad market average has risen to new highs. This is the first divergence we've seen in the cumulative NYSE TICK in many months. 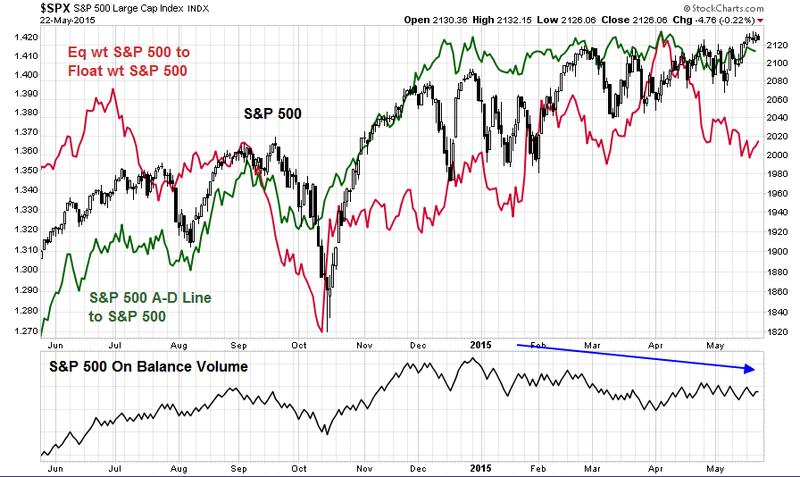 This excess of supply pressures over demand helps account for the weak breadth of the recent rally. Interestingly, yesterday we hovered at new highs in the index, but only 500 stocks across all exchanges traded at fresh one-month highs, while 389 touched fresh one-month lows. Volume in SPY has also been unusually low during the past several sessions. Since 2013, when SPY volume has been in its lowest quartile, the next ten days in SPY have averaged a loss of -.08%. When volume has been in its highest quartile, the next ten days in SPY have averaged a gain of 1.41%. 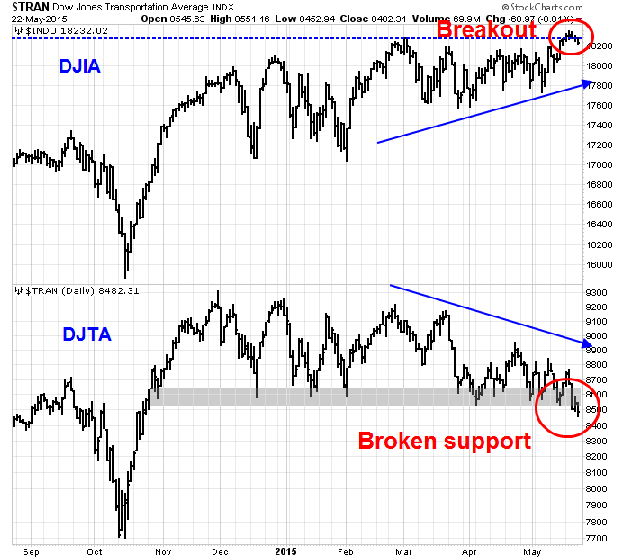 A break to new highs on expanded volume and breadth would clearly violate the pattern of weakness noted above. Until that point, I don't see an edge in chasing the upside. 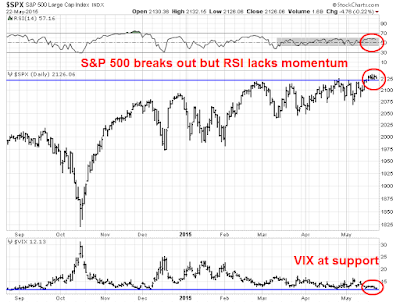 Similarly, average RSI(5) of SPX stocks has been falling, indicating a negative momentum divergence. I could go on, but this looks like a very tired bull. At the same time, we have a mixed macro outlook. While there were bright spots, such as the better than expected housing permits and housing starts, the latest update of Doug Short`s Big Four Recession Indicators continue to show very weak readings. The April Big Four average is on the verge of going negative, which would be the second time in three months (emphasis added). The overall picture of the US economy had been one of slow recovery from the Great Recession. We had a conspicuous downturn during the winter of 2013-2014 and subsequent rebound. And weak Retail Sales and Industrial Production in recent months triggered a replay of the "severe winter" meme. However, we're now getting data points for Spring months, not the Winter, and as yet we're not seeing a rebound. Industrial Production has decline for five consecutive months and Real Retail Sales have contracted for four of the past five months. At this point, the average of these indicators in recent months suggests that the economy remains near stall speed, and the risk of a downturn appears to have increased. We further saw further disappointment globally last week as the HSBC-Markit Manufacturing PMIs missed expectations in the US, Europe and China. 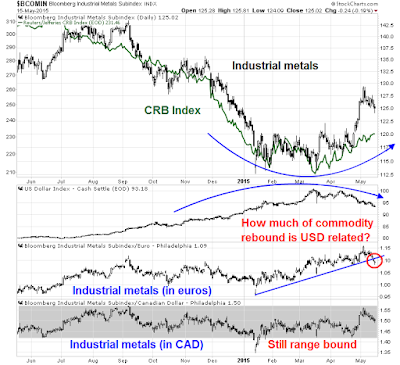 Commodity prices, which are sensitive barometers of global growth and a key component of the Trend Model, are still showing a bearish trend. 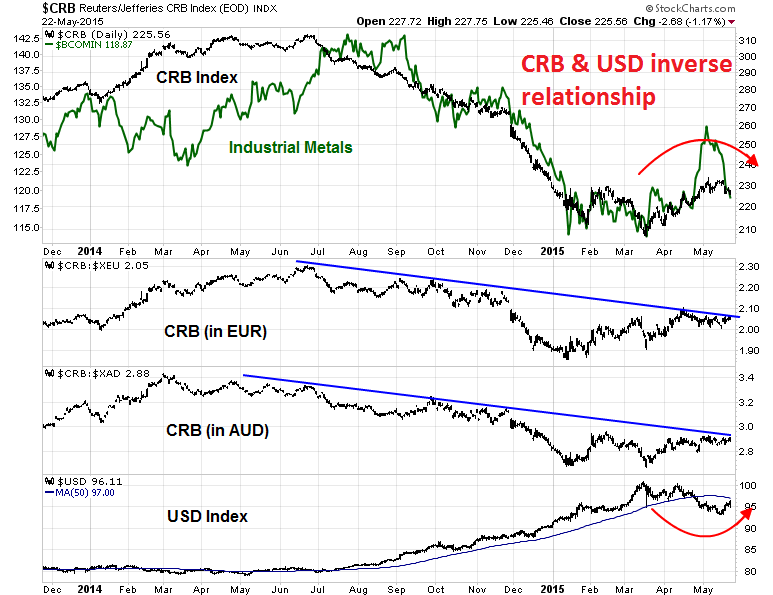 While USD strength last week no doubt created headwinds for commodity prices, the chart below of the CRB Index priced in euros and Australian Dollars show that commodity prices remain in a long-term downtrend. For equities, the earnings outlook is a key driver of stock prices. 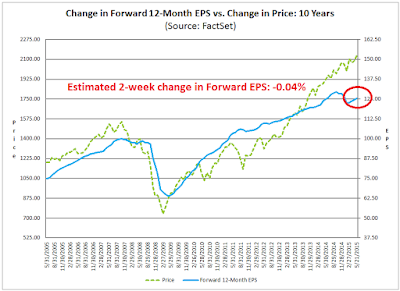 I was surprised to see the latest update from John Butters of Factset indicating that upward momentum in forward EPS has stalled after a few weeks of rebound. 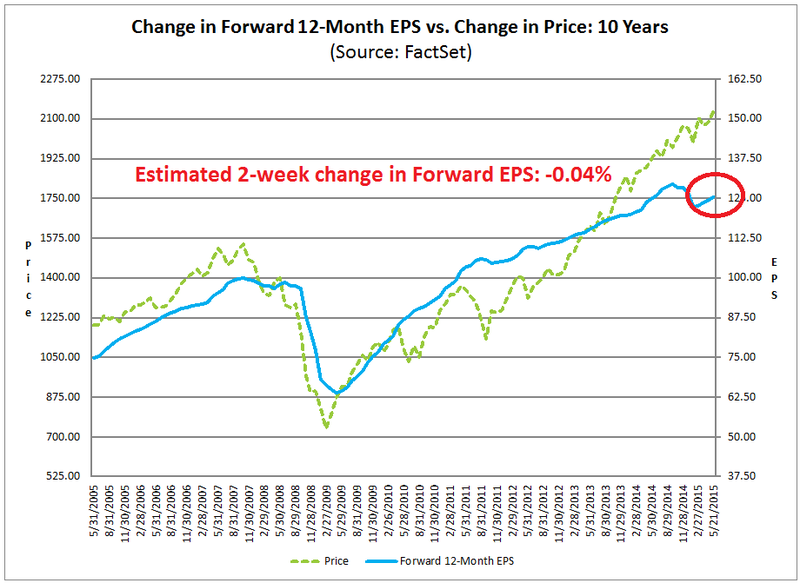 My own estimate of the two week change (there was no Factset update for one week) in forward EPS for the SP 500 was -0.04%. The decline was attributable to a fall in FY2016 EPS from 134.36 to 134.25. The US economy remains in a shallow industrial recession, but the remainder of the economy, as shown by housing permits and initial jobless claims remains quite positive. This has been driven by a 16% appreciation of the US$ globally, and secondarily by the effects of the collapse of commodity prices on raw materials producers. I expect the US$ to continue to retreat due to coincident weak economic performance, and the underlying past positivity of the US long leading indicators will come through. In a previous post, he wrote that while industrial production was weakening, we are not seeing the classic signs of recession from employment and housing, which remain strong. 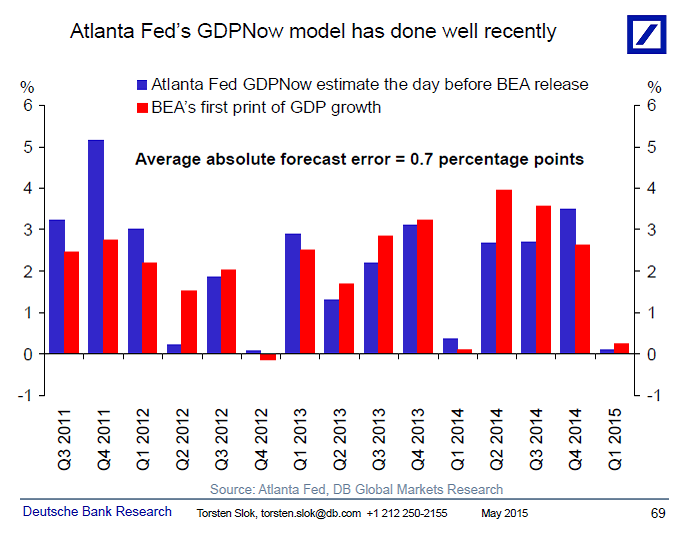 Instead of a full-blown recession, it looks like we just get a mid-cycle growth scare. The combination of a growth scare and a Federal Reserve that is determined to start raising rates this year, which Janet Yellen made abundantly clear in her latest speech, is likely to spark a corrective episode in the stock market, Now throw into the mix a possible wildcard such as a Greek default (that is looking more and more likely as the IMF and EU may be at odds with each other and the Greek interior minister stated that the IMF will not be paid in June), you have the ingredients of a market downturn much like what we saw in 2010 and 2011. Notwithstanding the recent Fedspeak (see The Fed`s Magical Mystery Tour), the Fed is already well on its way to normalizing monetary policy. The chart below shows the relationship between YoY change in M2 money supply and YoY change in the SP 500, lagged 1 year. 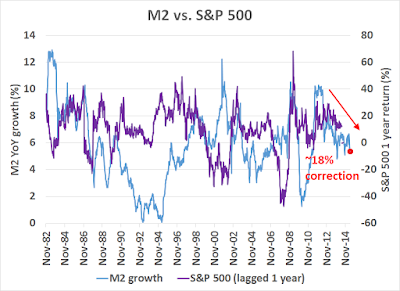 M2 growth has been showing a decelerating pattern for some time. While the relationship is by no means perfect, it currently implies a YoY SP 500 decline of 7-8%. 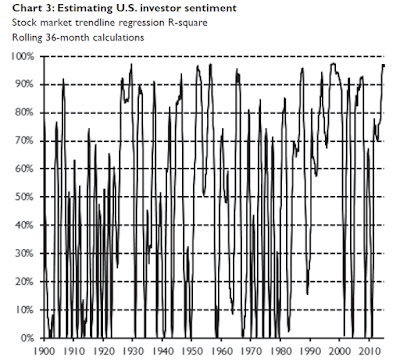 Since the SPX was about 1911 a year ago, that would imply a market downturn of about 18%, which is consistent with the 15-20% hiccups seen in 2010 and 2011. My base case scenario is therefore a rough downside SPX target of 1750 on this possible market downdraft. The week ahead is a holiday shortened week. In the last few weeks, the SPX has continued to show a pattern of indecisive price momentum as it refused to get overbought on advances and oversold on declines. 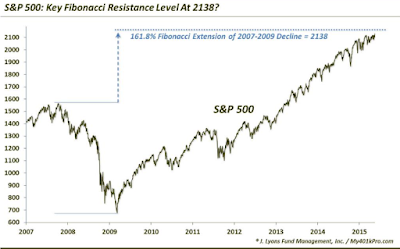 In the meantime, the market is likely capped by the Fibonacci resistance of 2136, which was mentioned earlier, a mildly overbought condition and the VIX Index, which is inversely correlated to stock prices, resting on key support. We have seen two consecutive bearish reversal candles in the last two days. A bearish reversal candle is one where a new high is made and then the day closes red. These candles are common enough, and if you look through the SPX chart you will see many of these both at tops and smaller reversals. Series of this type of candle are rare however. Now the first thing that really springs to the eye here is that the only two of these series of two bearish reversal candles made a new high short term, and one of those was the September 2014 series of three. 8 of the 9 resolved down effectively immediately. If we should beat Wednesday's high at 2134.72 before a decline to at minimum a test of 2099.5 then this time would be a rarity, and that could happen, but the odds are against it, and if seen that would most likely be because of tiny holiday volume. . I would note that the SPX high yesterday was 0.44 handles under Wednesday's new all time high. This setup is highly bearish short term and the median decline from it has been in the 4/5% area. My inner investor is cautious and his asset allocation is neutrally weighted at levels determined by his long-term investment policy. My inner trader remains short the market. 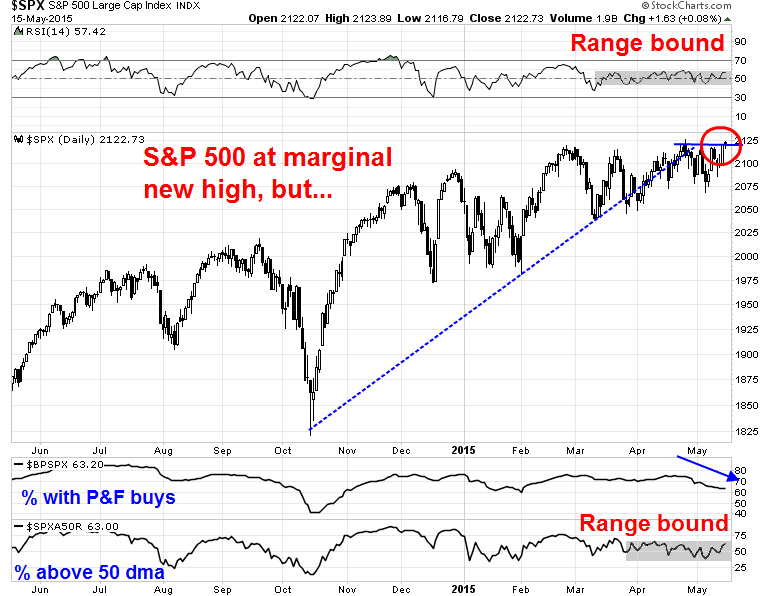 In light of the recent weakness of the DJ Transports, there has been a greater focus on the idea of market breadth and what it tells us. I have heard a lot about how the Transports don`t represent the US economy or market in the same way when Charles Dow first devised the Dow Theory. 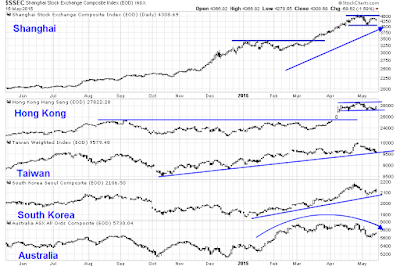 When you boil it all down, the divergence between the DJIA and DJTA represents a form of breadth divergence. The best representation of market breadth can be explained this way. When an army is advancing, you want to know if only the generals are leading the charge or if the whole army is moving forward. 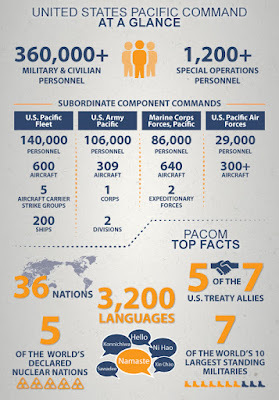 In market terms, the generals represent the heavyweights of the market, while the army represent the broader market. 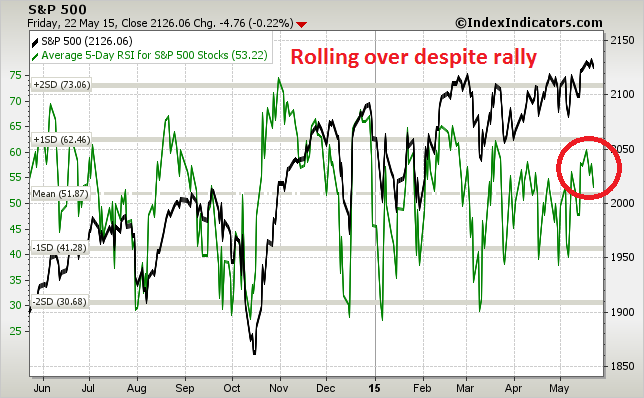 A market rally on positive breadth is said to be supported by the broad market. By contrast, a rally on narrow breadth is led only by the leadership of the heavyweights and such advances are interpreted with greater skepticism. 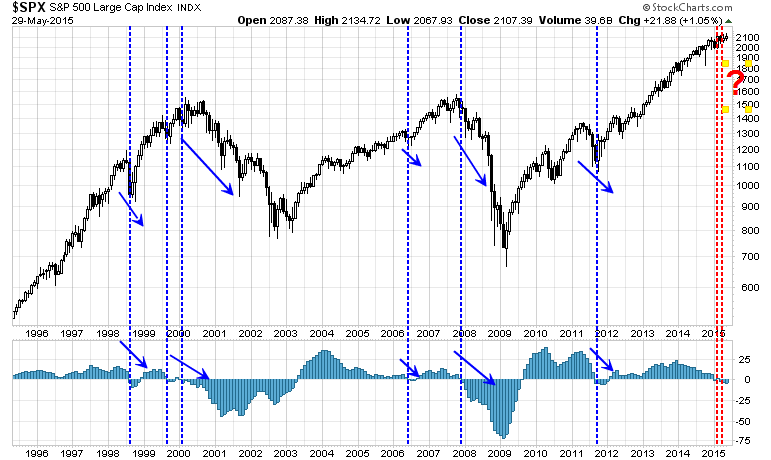 In the past, common breadth measures have included the NYSE Advance-Decline Line or NYSE Composite. In more modern times, one problem with this approach is that the underlying components of NYSE-listed stocks do not include the more growth oriented NASDAQ stocks. In addition, the NYSE Composite has a number of closed-end funds and REITs which may not be representative of the broad market (aka the army). 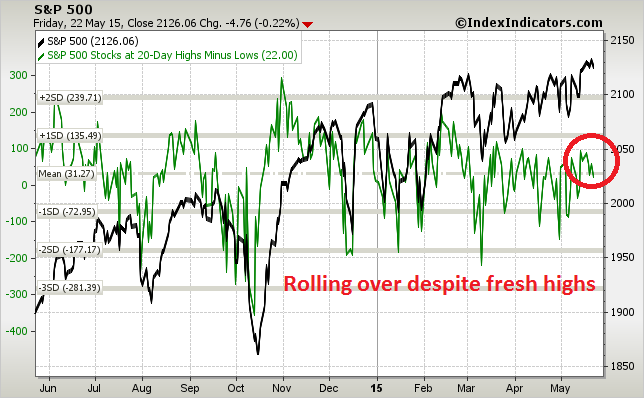 What is needed is an apples-to-apples comparison of market breadth. 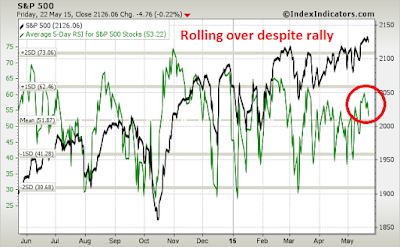 Enter the SP 500 A-D line and Equal weighted SP 500 as a breadth benchmark for the SPX. These measures do not suffer from the shortfalls of the NYSE A-D Line or NYSE Composite because they measure the breadth of the same stock universe. Each is slightly different. The A-D Line is a diffusion index. A single stock advancing will have the same impact on the A-D Line regardless of whether the magnitude of the advance is 0.1% or 10%. 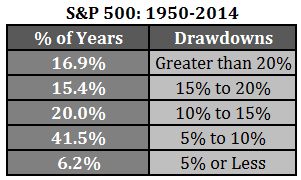 By contrast, a 0.1% advance in a stock will affect the Equal-weighted SP 500 differently than a 10% advance. The difference between the equal-weighted and float-weighted SP 500 is that the movements in heavyweights such as AAPL will affect the float-weighted index far more than the smallest stocks in the index. 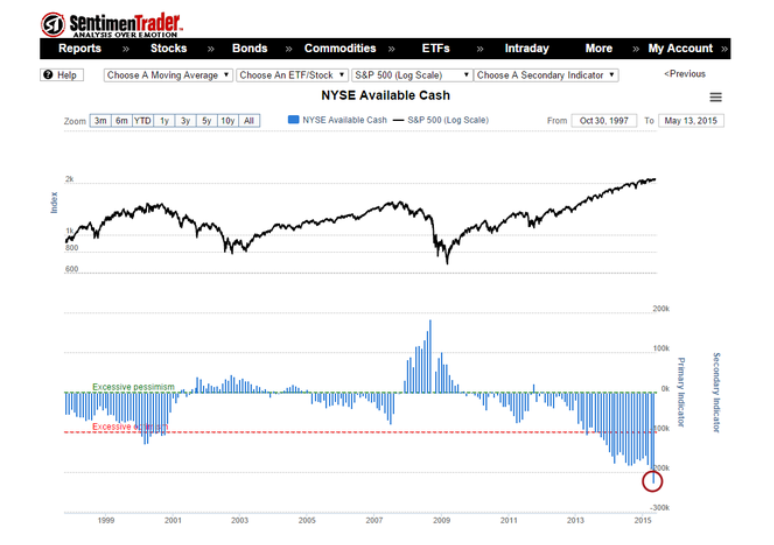 The chart below shows the 10-year record of the SP 500 and the A-D Line and Equal-weighted SP 500. In order to graphically exaggerate divergences, I have graphed the ratios of the A-D Line to the SP 500 (in green) and Equal-weighted SP 500 to the float weighted SP 500 (in red). 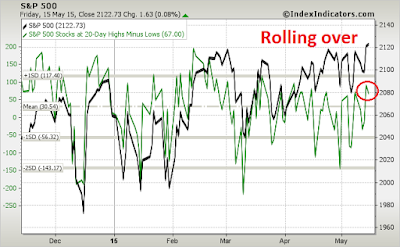 The bottom panel of the chart shows the rolling 52-week correlation of each of the indices to the SPX. As the correlation analysis shows, the A-D Line ratio is highly correlated to the SPX, which makes spotting divergences difficult. 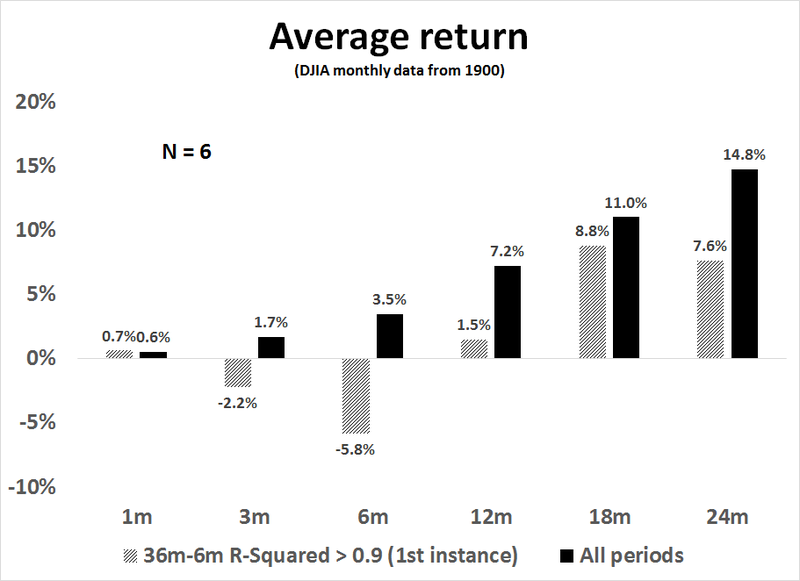 The correlation of the returns of the equal to float weighted ratio is relatively high and positive, but fluctuates. This makes the task of spotting divergences a little easier. 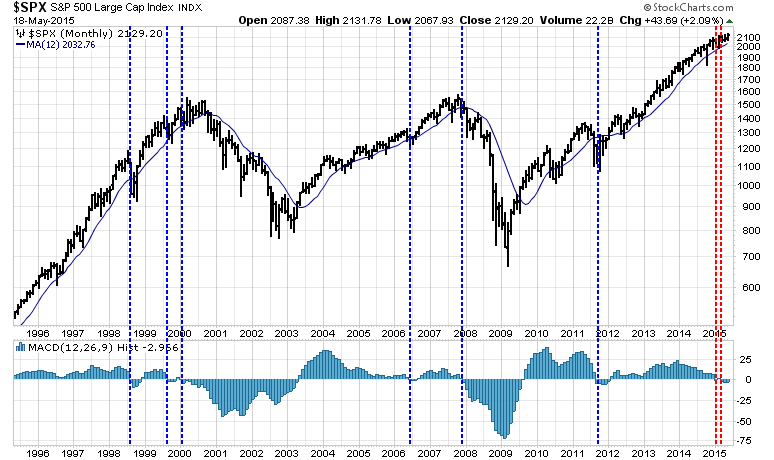 These indicators did a relatively good job of confirming stock market trends over the last 10 years. 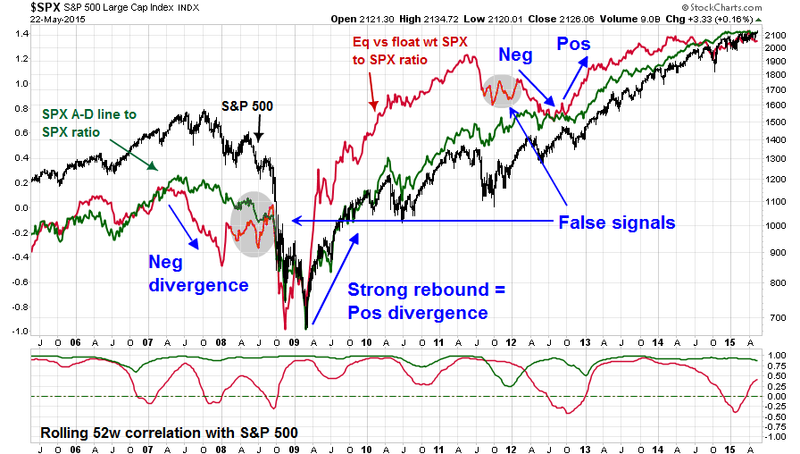 They were able to give early warnings of a negative divergence ahead of the market top in 2007; they confirmed the powerful rebound at the bottom in 2009; and gave early warnings of market weakness and subsequent rally in 2012. No indicators are perfect, however. 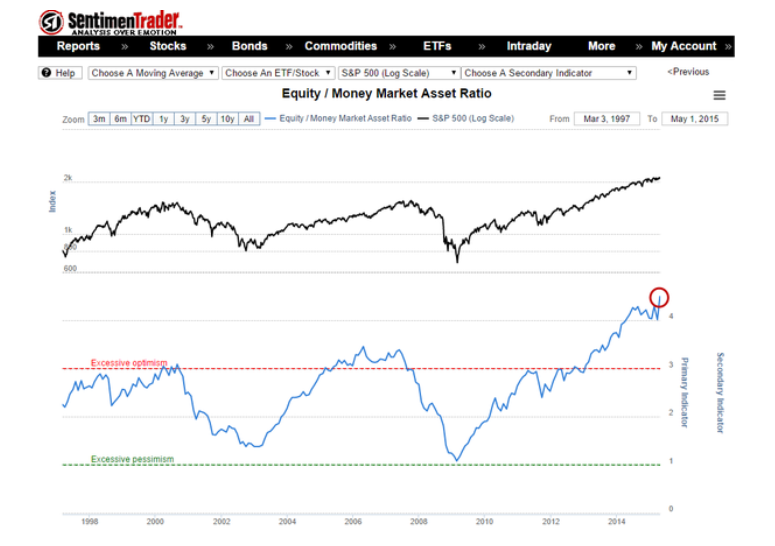 The equal-float weighted ratio gave a false signal and turned bullish prematurely in 2008 and it was unable to spot the market rally in 2011. 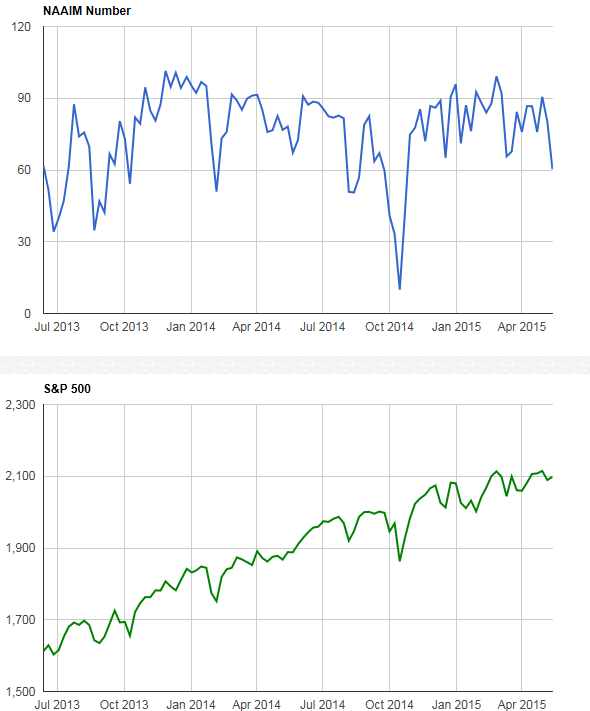 What are they telling us now about market internals? 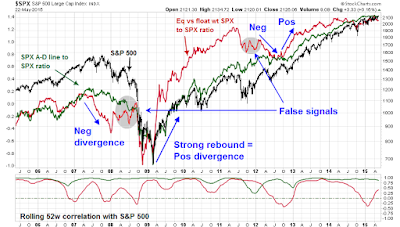 As the chart below shows, but of these indicators are showing negative breadth divergences. The equal-float weighted ratio has been falling while the stock market has rallied in the last two months. 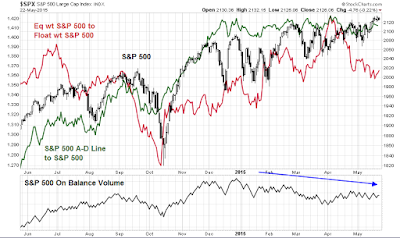 During the same period, the A-D Line ratio has been flat, which is another sign of the lack of broad market participation in the current rally. In addition, the bottom panel shows a negative divergence in On Balance Volume, which is an additional warning of distribution. 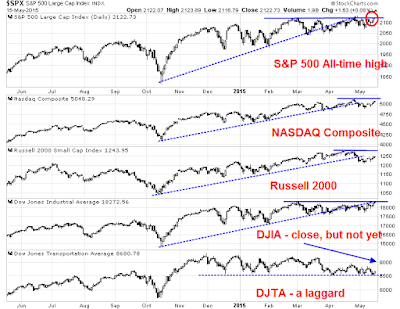 In light of these negative breadth divergences, it makes the recent divergence between the DJIA and DJTA create concerns for stock prices (see How worried should you be about the weak DJ Transports). 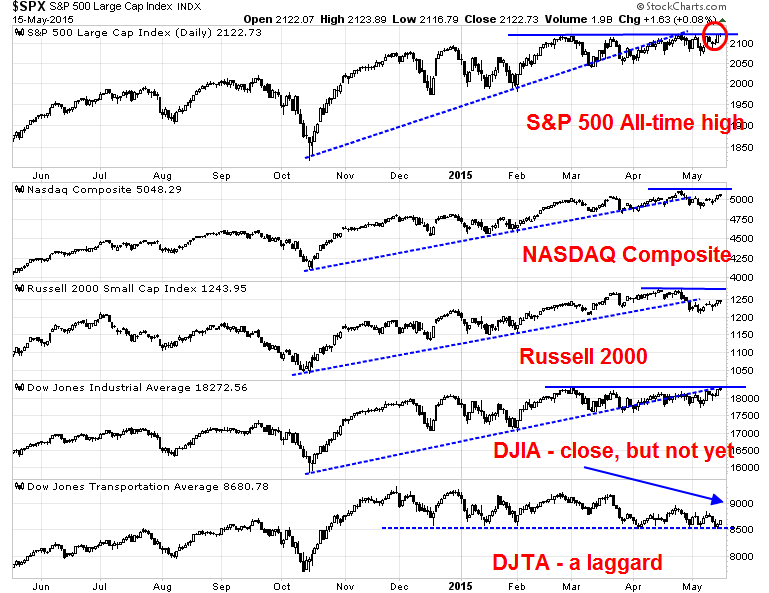 As the chart below shows, the DJIA rallied to new all-time highs last week, while the DJTA weakened. Its breach of a technically important support zone is further confirmation of the divergence. These conditions set up a Dow Theory non-confirmation of the new highs in the DJIA. Taken into a broad-based context of widespread weakness in market breadth, all of these signs are worrisome for the near-term health of the current bull run. To give you the punch line, I think the outlook for growth in economic activity and the labor market is good. However, inflation is too low, and it has been too low for the last 6 years. Moreover, my forecast is for inflation to rise at a very gradual pace, reaching our 2 percent objective only in 2018. Based on this forecast, and the risks to the outlook, I think the FOMC should refrain from raising the federal funds rate (our traditional short-term interest rate policy tool) until there is much greater confidence that inflation one or two years ahead will be at our 2 percent target. I see no compelling reason for us to be in a hurry to tighten financial conditions until then. In my view, it likely will not be appropriate to begin raising the fed funds rate until sometime in early 2016. Economic activity appears to be on a solid, sustainable growth path, which, on its own, would support a rate hike soon. However, the weak first-quarter data do give me pause, and I would like to see confirmation that they are indeed a transitory aberration. Furthermore, and most important, inflation is low and is expected to remain low for some time. Glad we know how you feel, Charles. Evans, who in his speech argued for rates to start rising in early 2016, told reporters if the FOMC had confidence that inflation was going to move up and that first quarter economic softness was temporary, "you could imagine a case being made for a rate increase in June". "I think we are going to go meeting-by-meeting to make that decision," Evans, a voter this year on Fed policy and among the most dovish of U.S. central bankers, said after taking part in a panel debate. WTF! What happened to raising rates in early 2016? For a confirmed dove like Charles Evans to make a remark like that, he must have been prepped. It is highly likely to have been part of a coordinated Fedspeak campaign to prepare the markets for an interest rate hike - call it the Fed's Magical Mystery Tour as Fed officials fan out around the globe and trumpet their message. Indeed, the WSJ had reported that John Williams of the San Francisco Fed had warned that a rate hike was on the table at every meeting and they weren't going to telegraph any further guidance. Fed Chair Janet Yellen warned about the risks from excessive equity valuation and to high yield bonds if rates were to rise (see Bulls shouldn`t expect help from the Fed). Fed Presidents like Charles Evans don't speak off the cuff. In an interview after his Fed Chair appointment had expired, Paul Volcker quipped when he went out to dine at a restaurant, he felt compelled to say, "I'll have the steak but that doesn't mean I don't like the chicken or the lobster." 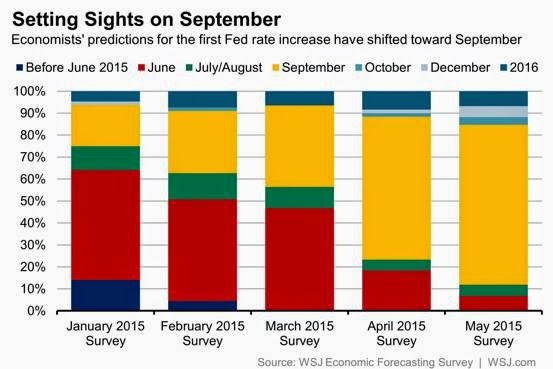 The Fed seems to be trying to nudge the markets to prepare for greater policy tightness and rate normalization. 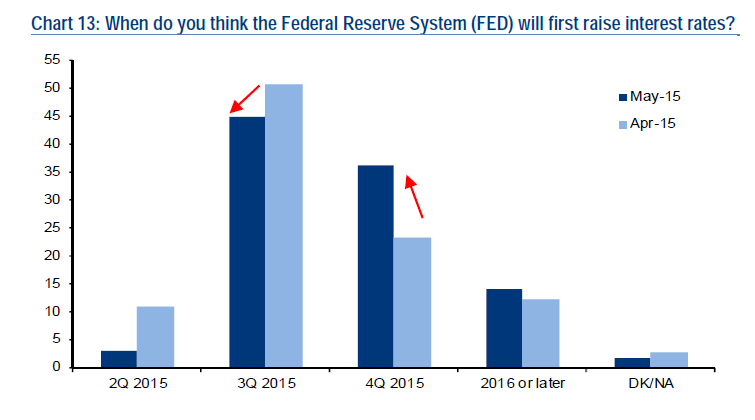 The latest BoAML Fund Manager Survey indicates that the consensus for first liftoff is either 3Q or 4Q, with 3Q being the most likely. My base case scenario therefore calls for a September rate hike, largely because the Fed seems to prefer to guide and nudge markets, rather than to surprise them. With the SPX at record highs, the market may need further Fed "nudging". Will there be further surprise guidance contained in the FOMC minutes to be released on Wednesday? Now that SPX has reached further all-time highs, I received a number of comments to my latest weekly market outlook post (see Where's the new high celebration?) which amounted to "you've been bearish and wrong for the past few weeks and now it seems that you are stubbornly making up reasons to stay that way". Under the circumstances, I feel compelled to respond and explain. Since I wrote those words, the US equity market averages continued to do the stutter step above and below the 50 dma and behave in a choppy fashion. 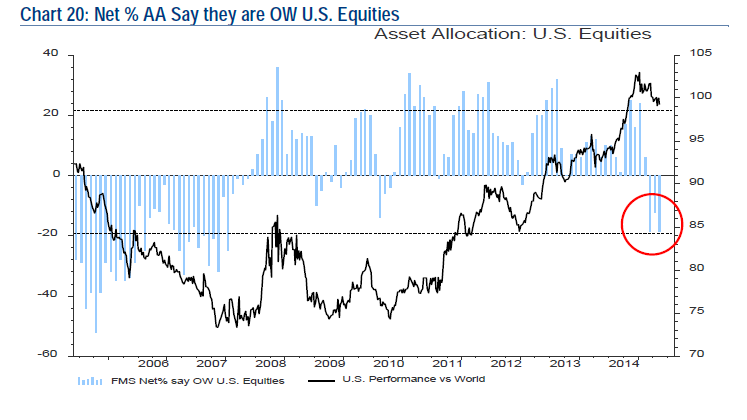 In April, a comprehensive study by James Paulsen of Wells Capital Management identified the current environment as market adherence to the long-term trend as overbought (my words, not his). Paulsen did the rolling 36-month regressions of stock prices and charted the R-squared of the regressions (the higher the R-squared, the tighter the fit). 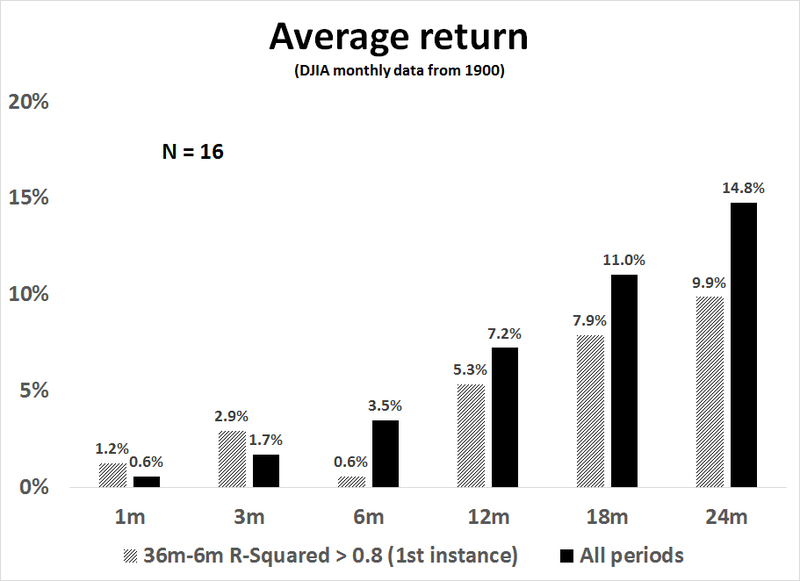 He found that current levels of R-squared is in the top decile of fit, which is consistent with the straight up stock market without a 10% correction that has been observed. Using Paulsen study methodological framework, I did some more research and compared the 36-month R-squared, or trend, with a shorter 6-month R-squared, or trend. I found that the two had diverged considerably, which confirms the Steenbarger comment (see How to make your first loss your best loss). Such episodes have tended to resolve themselves in a bear phase, largely because a weakening short-term trend combined with a strong long-term trend is indicative of weakening momentum. In fact, current readings are similar to conditions observed just before the Crashes of 1929 and 1987, though I am not forecasting a market crash as this model is better at forecasting direction than magnitude. 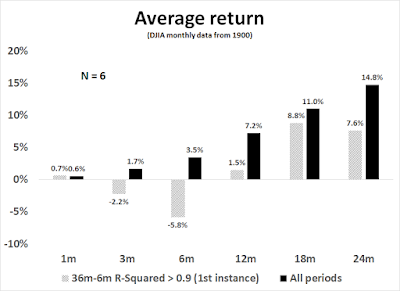 My research showed that, based on monthly data going back to 1900, such episodes of trend divergence have tended to resolve themselves in market downturns. That is how I came to the opinion that the next major move in stock prices is likely to be down. 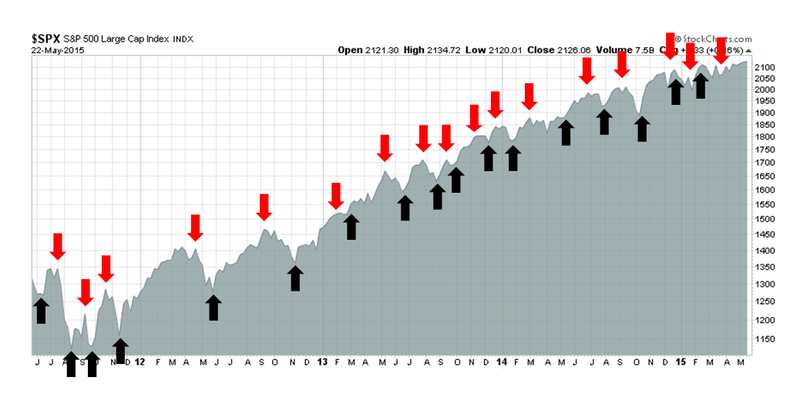 As the study was based on monthly data, recent market action amounts to mere squiggles. Another way of depicting the long and short term trend divergence is through the use of MACD. As the monthly chart of the SPX below shows, the MACD histogram has gone negative, indicating a loss of price momentum. Every past instance in the last 20 years has either seen stock prices either be in a bear phase, as measured by the 12 month moving average, when MACD turned negative, or resolved itself into a bear move soon afterwards. What would make me bullish? MACD divergence improvement: It doesn't necessarily have to go positive, but some signs that it is flattening out and starting to rise would help. 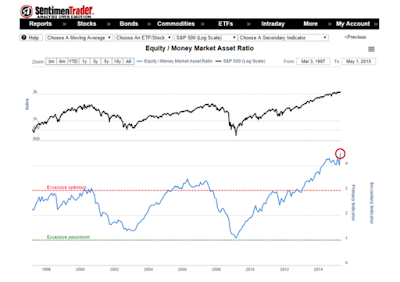 Stop the chop with better momentum: Now that the SPX has broken out to new highs, I would like to see some follow-through indicating that positive momentum has re-asserted itself. One useful sign would be a series of "good" overbought readings where the market gets overbought on indicators like RSI and stays overbought. 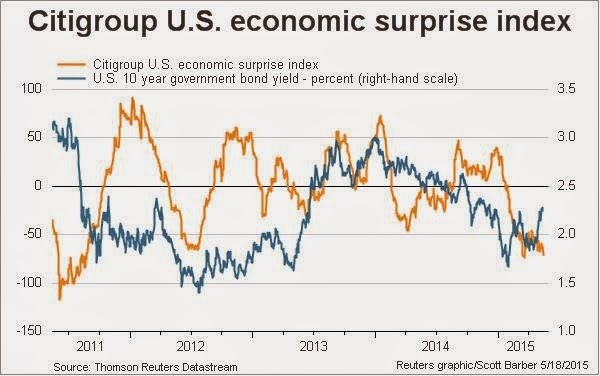 An improvement in macro outlook: The Citigroup US Economic Surprise Index has been mired in highly negative territory, indicating a preponderance of economic misses compared to beats. Doug Short's Big Four Recession Indicators are looking a little wobbly and New Deal democrat has been calling for a mild industrial recession, though the consumer sector remains healthy. So is it too much to ask for some signs of improvement in Citigroup ESI? 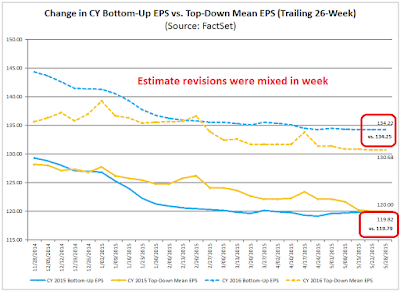 A consistent record of positive EPS estimate revisions. If the economy starts to improve, then the Fed is likely to raise rates, which would hold back stock market gains from PE expansion. The negative effects of a flat to falling PE can be offset by robust EPS growth. From a valuation viewpoint, it will be up to EPS growth that does most of the heavy lifting in pushing stock prices upward at this point of the economic cycle. Like all investors, I have been wrong before. Admittedly, such periods of negative performance creates valuable "scar tissue" that makes us all better investors - as long as we are willing to learn from our mistakes. For now, I remain cautious on stocks, but "data dependent". Where's the new high celebration? Imagine going to a wedding where virtually no one is celebrating. The guests are whispering in hushed tones. What could be wrong? Is the groom flirting with the bridesmaids? Did the bride run off with an old boyfriend (much like the final scene in The Graduate)? That what the stock market felt like last week. 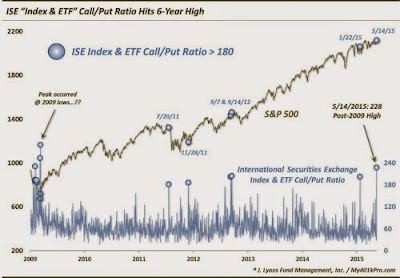 The SPX and OEX reached all-time highs, but market internals were unenthusiastic with exhibitions of positive momentum. As the chart below shows, RSI(14) remained in a tight range and behaved much like it had in the past few weeks when the market oscillated in a tight band. The % bullish metric flashed a negative divergence and % above the 50 day moving average was also range bound. 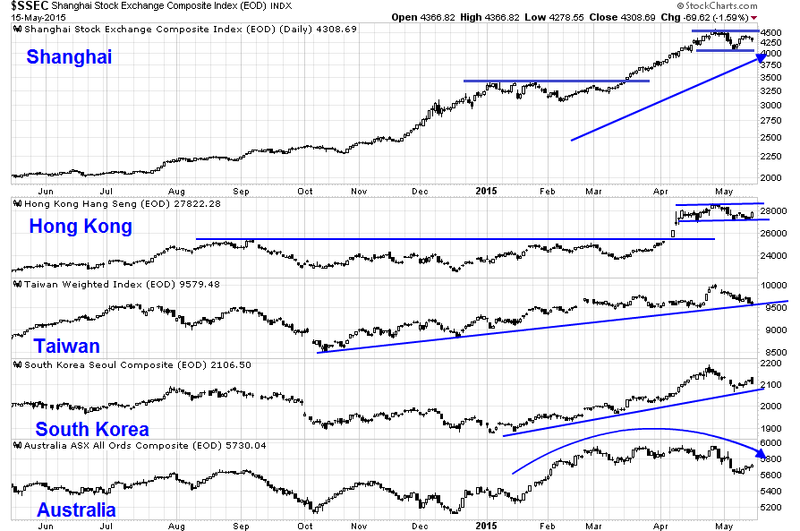 Other US stock market indices were not confirming the new highs either. The NASDAQ Composite, Russell 2000, the DJIA and DJTA were all below their highs, though the Dow was very close (see my post How worried should you be about the weak DJ Transports?). Moreover, all of the averages shown in the chart below are exhibiting a disturbing sign of having breached an uptrend indicating a loss of momentum. I was informed by another technical analyst that I had turned bearish too early, as such formations often resolve themselves with a sideways consolidation and sometimes a rally to a marginal new high before rolling over. 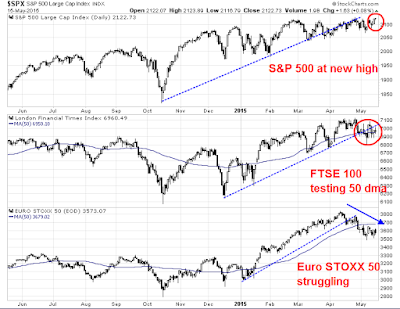 Looking abroad, SPX strength hasn't been confirmed by the European averages either. 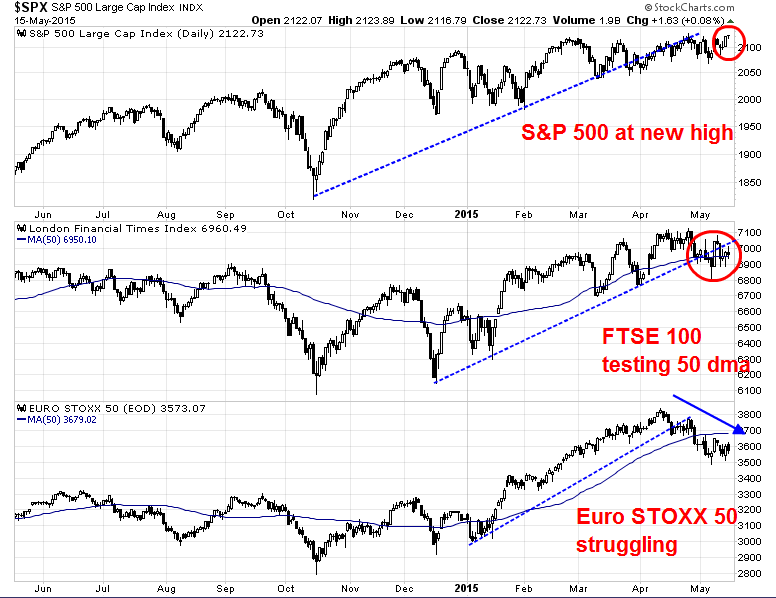 Both European averages also display the same characteristic breach of uptrend lines seen in the US averages. To be sure, not all inter-market analysis is painting a bearish picture. 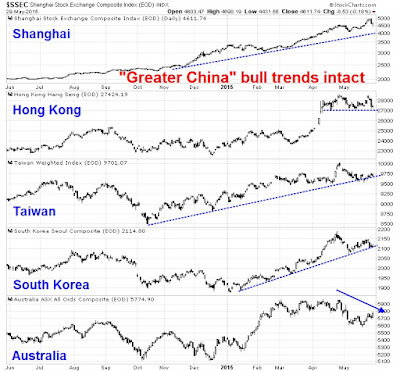 Despite the weakness in Europe, the technical conditions of the Greater China stock markets are mostly healthy. But then if US equities have to depend on Chinese stimulus as a source of global growth, we would be indeed be scraping the bottom of the barrel. Score breadth, momentum and inter-market analysis as bearish. I saw a number of bulls get very excited when NAAIM exposure showed a crowded short reading, which is contrarian bullish, and AAII sentiment survey showed that the percentage of AAII bulls had fallen to a two-year low (see analysis from Bespoke). 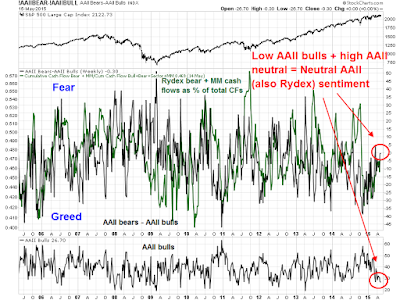 There is no doubt that the NAAIM exposure index is a bullish sign, but the AAII results have to seen in context as the high level of neutral opinions pushed the AAII bull to bear spread to an overall neutral reading. While I am not a big fan of opinion surveys as opinions can move on a dime, surveys where people put real money on the line are better indications of investor opinion. 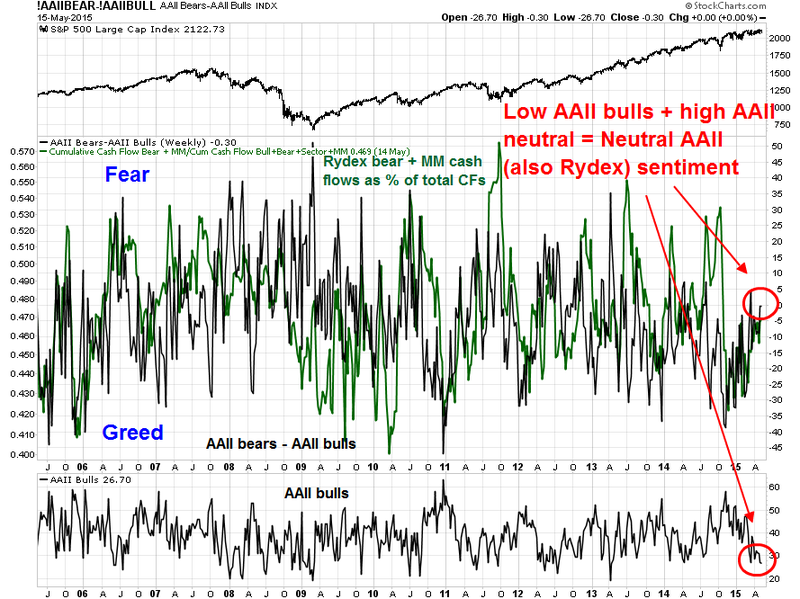 My own interpretation of the AAII sample and Rydex data are pointing to neutral sentiment readings. 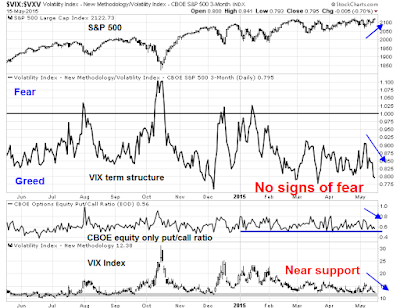 Other indirect indicators of sentiment from option data indicate that the market is complacent and showing no fear. 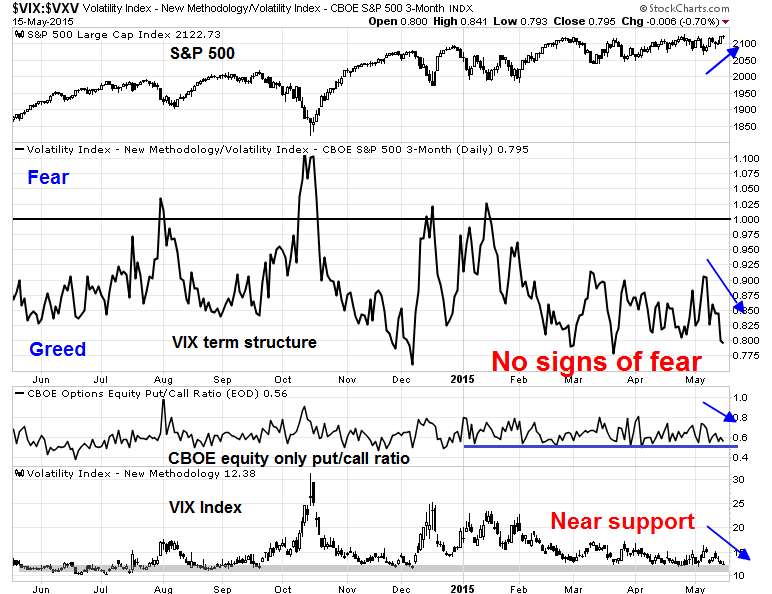 The chart below of the term structure of the VIX, the equity-only put-call ratio and the VIX Index itself, where high readings indicate fear and low readings indicate greed, are all showing complacent readings. Moreover, the all three versions of ISE call-put ratio (total, equity-only and index and ETF) moved above the 200% level on Thursday, which is a rare occurrence. Though the sample size is small and there was one important exception at the 2009 market low, such occasions have not been bullish signs in the past. 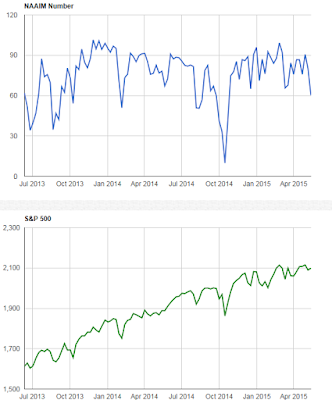 Score sentiment models as mixed to slightly bearish. With the exception of initial claims, all of last week's major macro releases missed expectations, such as retail sales, industrial production, consumer sentiment. The latest update of Doug Short's Big Four Recession Indicators is looking a little shaky. Of the four, Employment has consistently been positive< Industrial production was negative. Retail sales came in flat, but we have to wait for the inflation adjustment to see how negative it is. The last, real income, was negative last month. We may be seeing the worst of all worlds. We have a sputtering US economy and a Fed preparing to raise rates (see Bulls shouldn't expect help from the Fed), which would not only dampen growth but push the USD up and create earnings headwinds for companies. The US shouldn't expect much help from overseas. Even though the latest data shows that European growth is recovering, US growth is faltering and Chinese growth is decelerating. Gavekal has suggested that global sales growth may have peaked for this cycle. 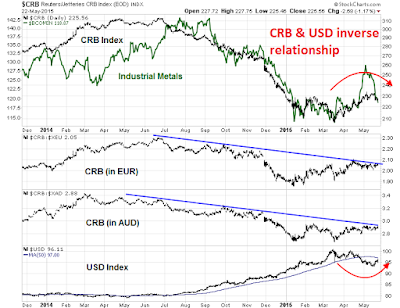 Commodity prices, which have been good indicators of global growth, may be confirming that conclusion. While commodity prices appear to have bottomed in the last few weeks, much of the strength is attributable to USD weakness. 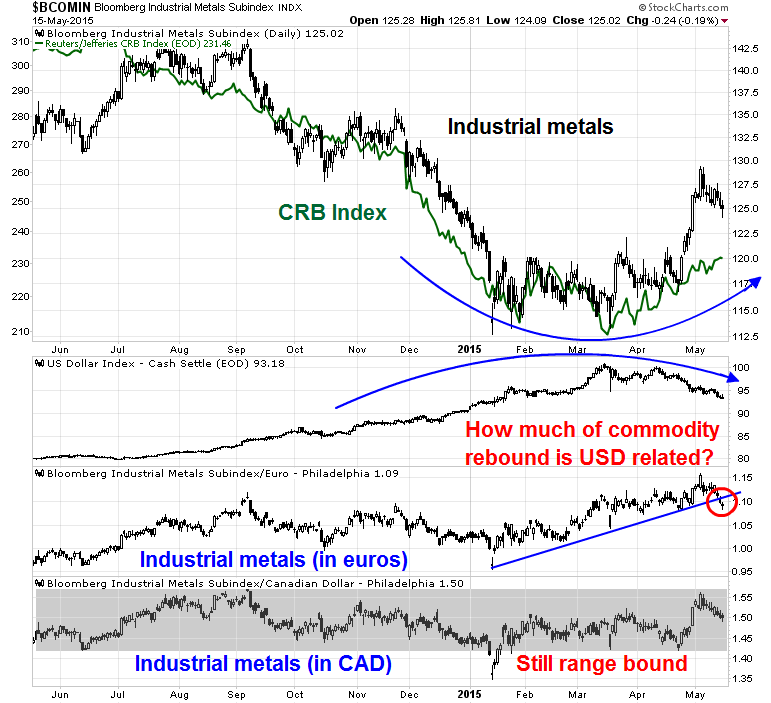 A glance at industrial metals, a key input to the global growth engine, in EUR and CAD leads to a different conclusion. Score the macro conditions as being a bit on the weak side. 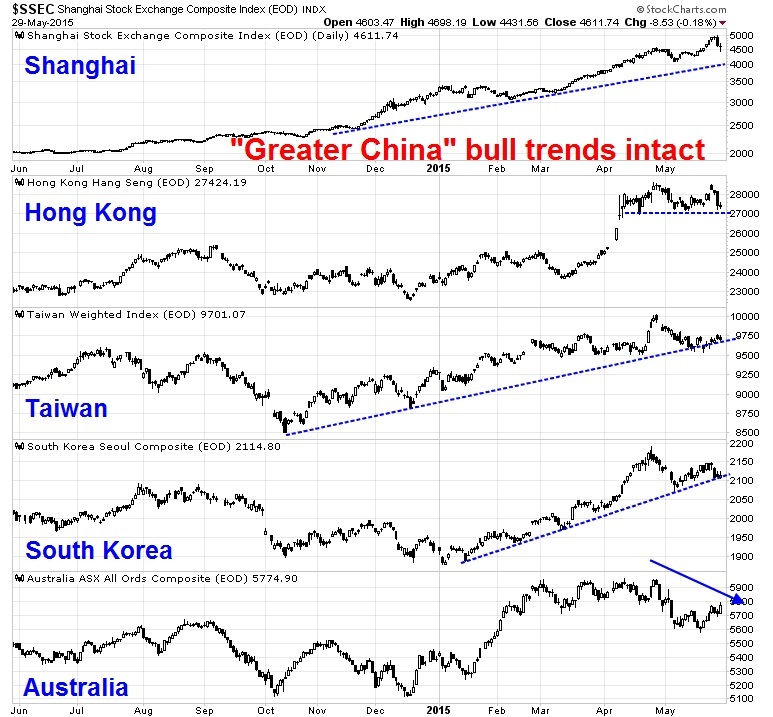 Great China stock markets are supportive of growth. While I tend to discount the gyrations of the Chinese equity market because of its retail orientation and casino mentality, the message from HK, Korea and Taiwan is more stimulus from Beijing (see previous comment above). NAAIM exposure came in at a historically low level, which is contrarian bullish. The NAAIM exposure index shows what RIA managers are doing with their assets and it has been a terrific contrarian indicator. Retail sales may not be that bad. David Rosenberg pointed out that some components of personal expenditures no accounted for in retail sales are growing strongly, such as air travel,theme park spending and car leasing. NFIB small business optimism rose and beat expectations. This is a contrary sign of a tanking economy. Forward EPS revisions have become more constructive. The latest update from Ed Yardeni shows that forward 12-month estimates are rising for large caps and small caps, but falling for mid caps, compared with falling estimates for small and mid caps in the previous week. EPS estimates for the large cap SP 500 have risen for two consecutive weeks. Could the growth scare be over? The economic weakness may prompt the Fed to delay the interest rate normalization process. A recent Jon Hilsenrath WSJ article indicates that the Fed would like to raise rates and begin the interest rate normalization process, but the soft patch in the economy is likely to push out the date of the first liftoff. According to the WSJ, the current consensus is for the Fed to first raise rates in September, but we are likely to get greater clarity on this issue when FOMC minutes are released on Wednesday. 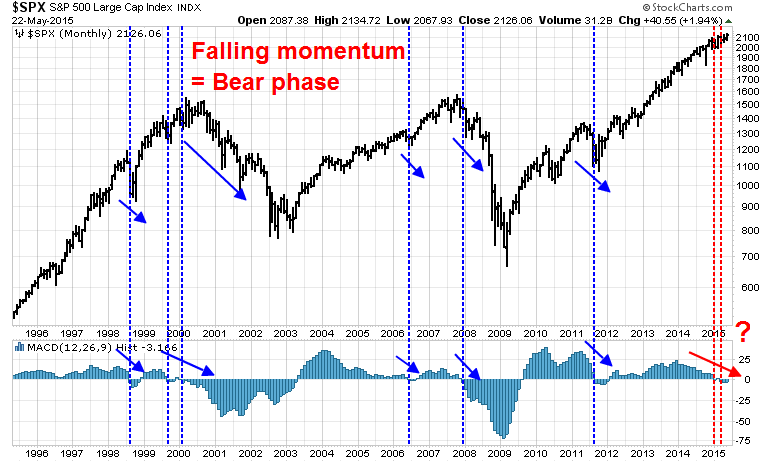 Despite the smattering of bullish indicators, the weight of the evidence is intermediate term bearish. Technically, breadth, momentum and sentiment models are tilted bearishly. The economy remains weak and the Fed is about to begin a tightening cycle. When it does, rising rates will be USD bullish, which will create headwinds for corporate earnings. This review is much too long and it`s time to wrap up. 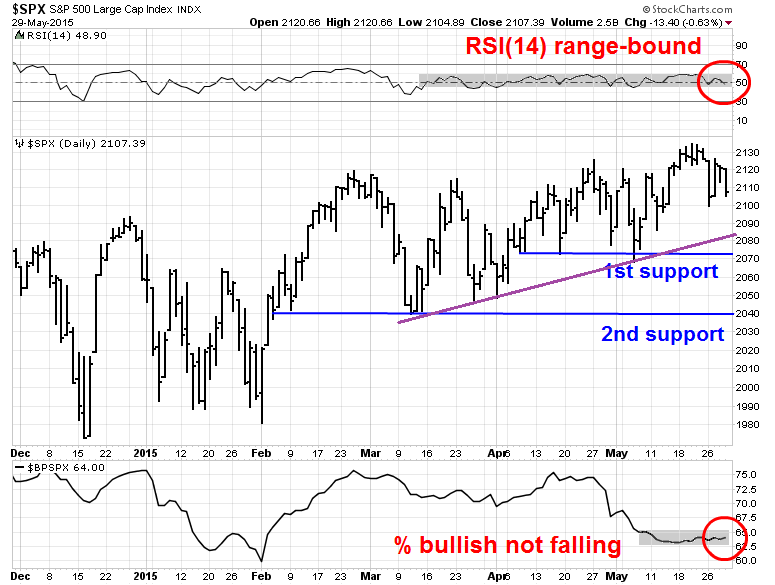 In summary, the new high shown by the SPX last week is unconvincing. 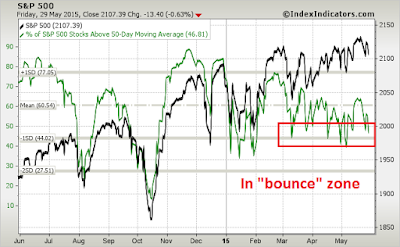 Market action continues to be suggestive of a wimpy bull-wimpy bear range bound market. 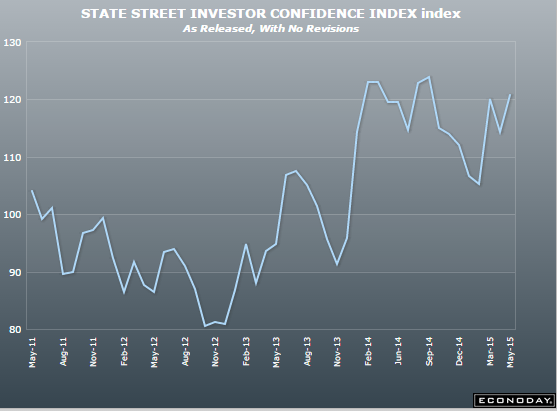 Short-term indicators like this one from IndexIndicators.com show that readings are nearing levels where the market has sputtered in the past few weeks. 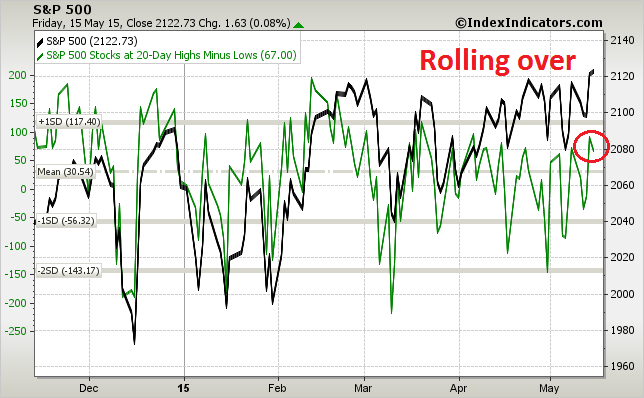 Indeed, this chart of net 20-day highs - lows rolled over on Friday, even as the index made a marginal high. 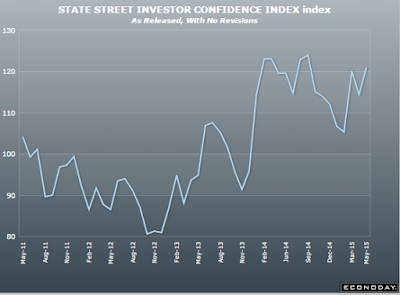 My inner investor remains cautious, but not overly panicked. My inner trader remains short, Should a decline materialize next week, he will be watching for signs of negative momentum of prolonged oversold conditions. Otherwise, his base case is a brief market swoon, to be followed by the usual short rally - until the real bear episode begins. At last, is this the correction?